Life Response in Work at the MENTAL Level Pt.4 4/2/2015 8:26 AM. 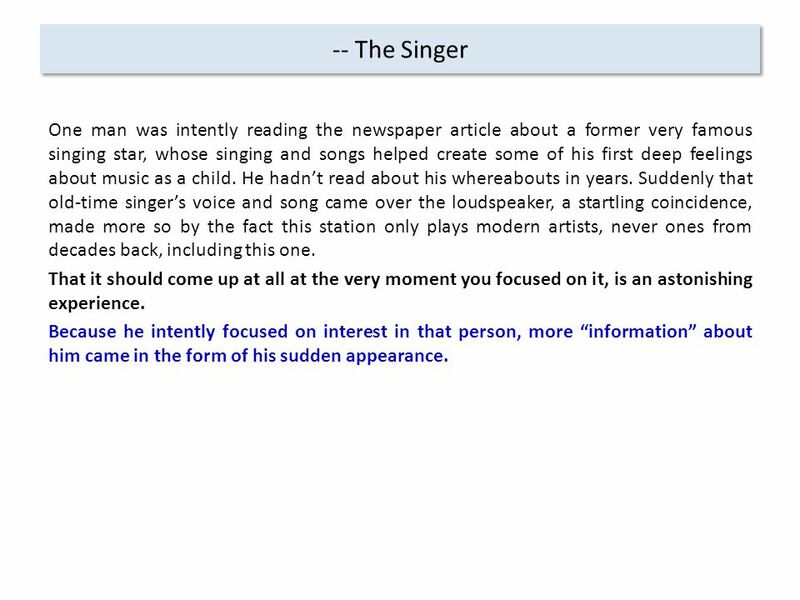 4 -- The Singer One man was intently reading the newspaper article about a former very famous singing star, whose singing and songs helped create some of his first deep feelings about music as a child. He hadn’t read about his whereabouts in years. Suddenly that old-time singer’s voice and song came over the loudspeaker, a startling coincidence, made more so by the fact this station only plays modern artists, never ones from decades back, including this one. That it should come up at all at the very moment you focused on it, is an astonishing experience. Because he intently focused on interest in that person, more “information” about him came in the form of his sudden appearance. 5 -- The Sign In another work-related example a man thought of the fact that a 2-page proposal a group of his had developed had turned out so utterly perfectly. 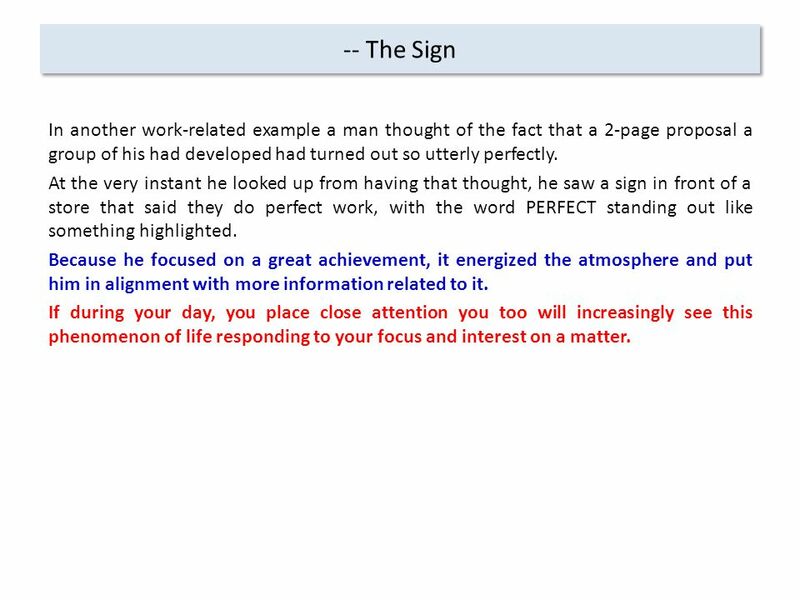 At the very instant he looked up from having that thought, he saw a sign in front of a store that said they do perfect work, with the word PERFECT standing out like something highlighted. Because he focused on a great achievement, it energized the atmosphere and put him in alignment with more information related to it. 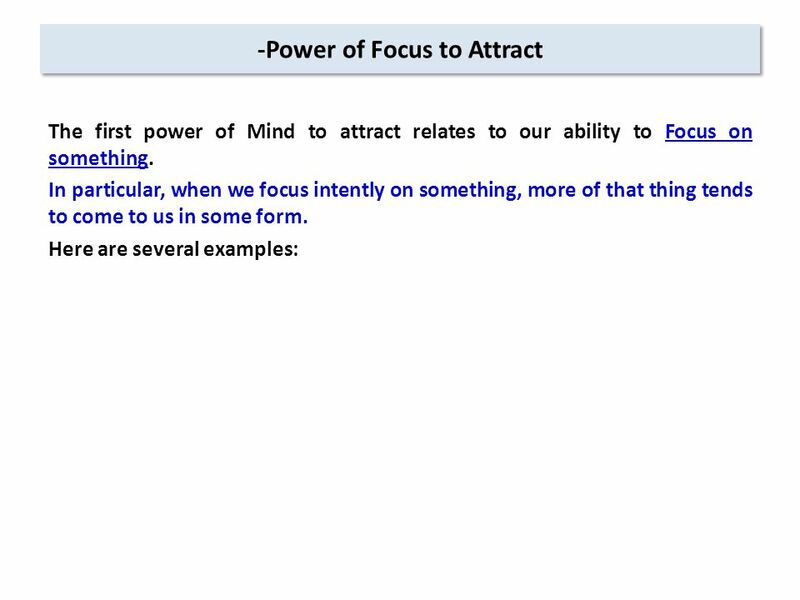 If during your day, you place close attention you too will increasingly see this phenomenon of life responding to your focus and interest on a matter. 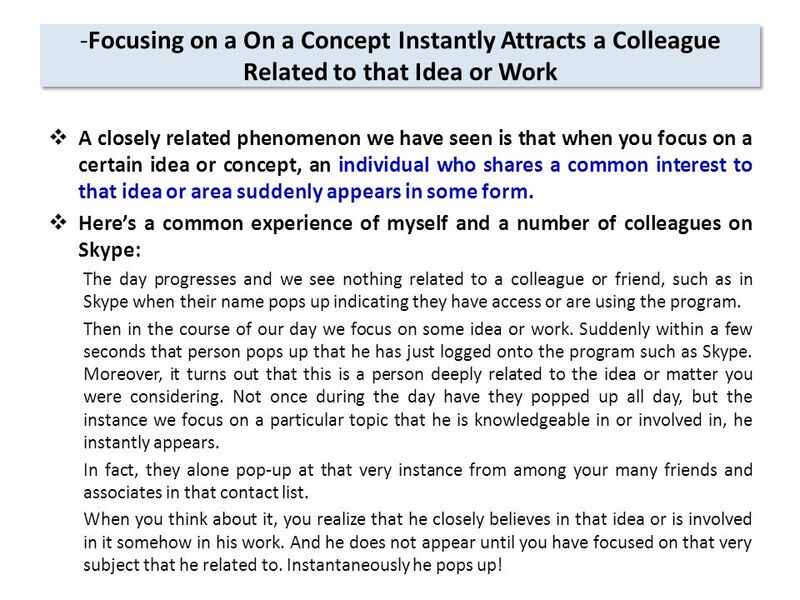 6 -Focusing on a On a Concept Instantly Attracts a Colleague Related to that Idea or Work  A closely related phenomenon we have seen is that when you focus on a certain idea or concept, an individual who shares a common interest to that idea or area suddenly appears in some form.  Here’s a common experience of myself and a number of colleagues on Skype: The day progresses and we see nothing related to a colleague or friend, such as in Skype when their name pops up indicating they have access or are using the program. Then in the course of our day we focus on some idea or work. Suddenly within a few seconds that person pops up that he has just logged onto the program such as Skype. Moreover, it turns out that this is a person deeply related to the idea or matter you were considering. Not once during the day have they popped up all day, but the instance we focus on a particular topic that he is knowledgeable in or involved in, he instantly appears. In fact, they alone pop-up at that very instance from among your many friends and associates in that contact list. When you think about it, you realize that he closely believes in that idea or is involved in it somehow in his work. And he does not appear until you have focused on that very subject that he related to. Instantaneously he pops up! 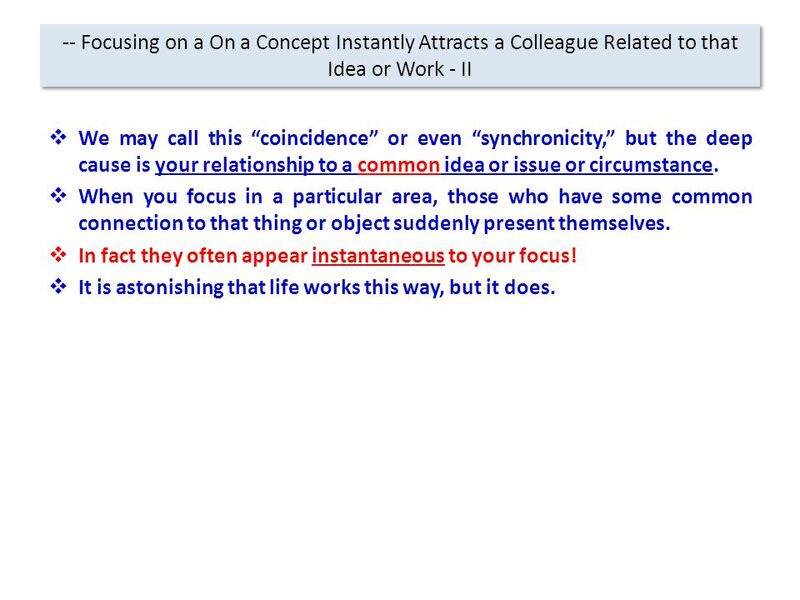 7 -- Focusing on a On a Concept Instantly Attracts a Colleague Related to that Idea or Work - II  We may call this “coincidence” or even “synchronicity,” but the deep cause is your relationship to a common idea or issue or circumstance.  When you focus in a particular area, those who have some common connection to that thing or object suddenly present themselves.  In fact they often appear instantaneous to your focus!  It is astonishing that life works this way, but it does. 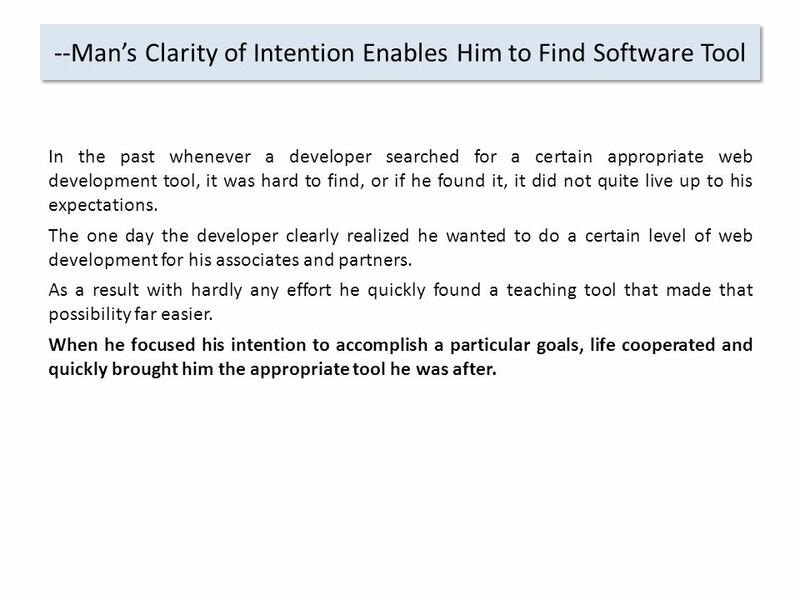 10 --Man’s Clarity of Intention Enables Him to Find Software Tool In the past whenever a developer searched for a certain appropriate web development tool, it was hard to find, or if he found it, it did not quite live up to his expectations. The one day the developer clearly realized he wanted to do a certain level of web development for his associates and partners. As a result with hardly any effort he quickly found a teaching tool that made that possibility far easier. When he focused his intention to accomplish a particular goals, life cooperated and quickly brought him the appropriate tool he was after. 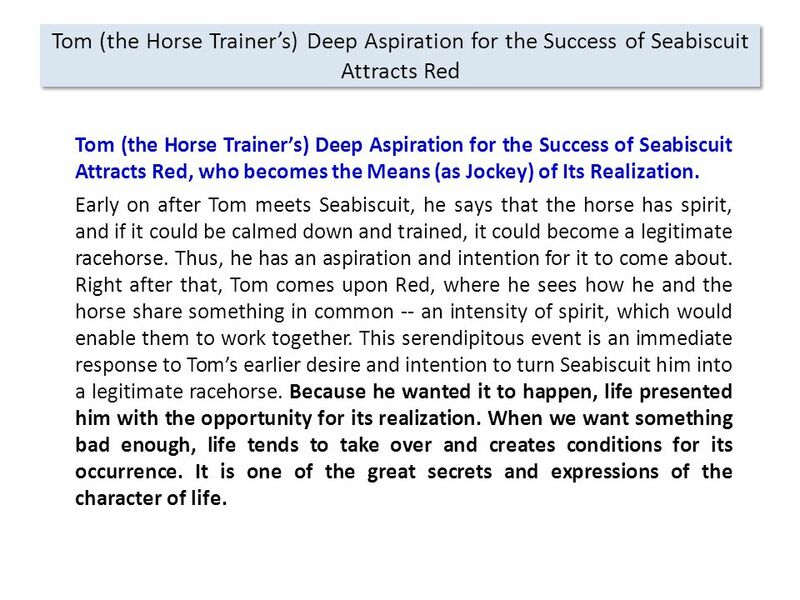 12 Tom (the Horse Trainer’s) Deep Aspiration for the Success of Seabiscuit Attracts Red Tom (the Horse Trainer’s) Deep Aspiration for the Success of Seabiscuit Attracts Red, who becomes the Means (as Jockey) of Its Realization. Early on after Tom meets Seabiscuit, he says that the horse has spirit, and if it could be calmed down and trained, it could become a legitimate racehorse. Thus, he has an aspiration and intention for it to come about. 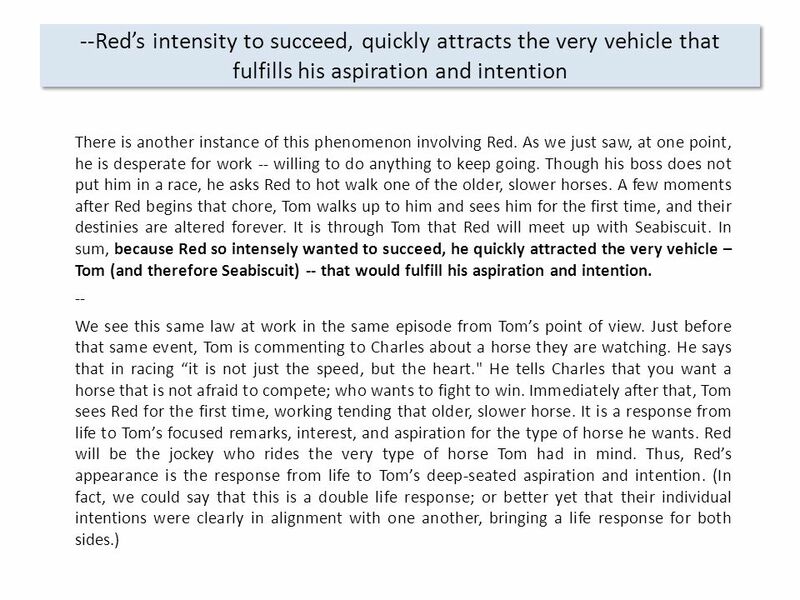 Right after that, Tom comes upon Red, where he sees how he and the horse share something in common -- an intensity of spirit, which would enable them to work together. This serendipitous event is an immediate response to Tom’s earlier desire and intention to turn Seabiscuit him into a legitimate racehorse. Because he wanted it to happen, life presented him with the opportunity for its realization. When we want something bad enough, life tends to take over and creates conditions for its occurrence. It is one of the great secrets and expressions of the character of life. 14 Charles’ deep interest and intention of getting into horseracing and purchasing horses quickly attracts the person to accomplish it. 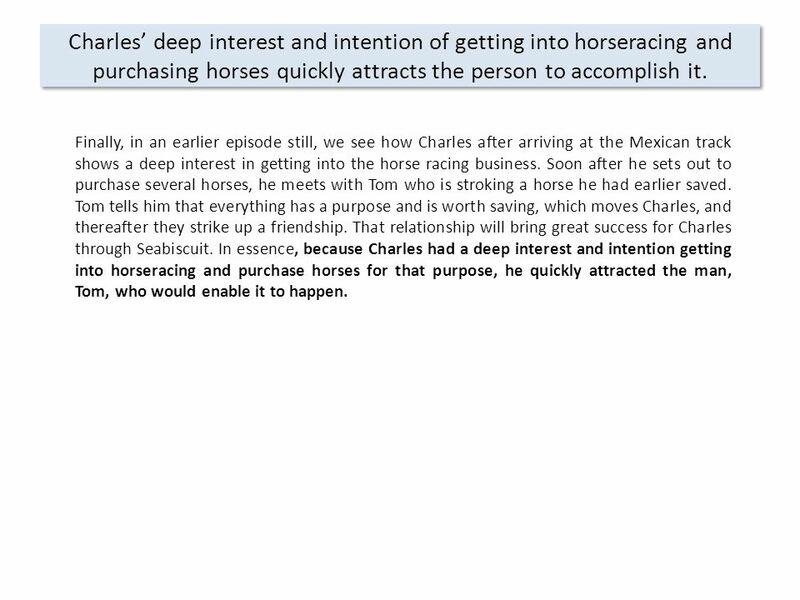 Finally, in an earlier episode still, we see how Charles after arriving at the Mexican track shows a deep interest in getting into the horse racing business. Soon after he sets out to purchase several horses, he meets with Tom who is stroking a horse he had earlier saved. Tom tells him that everything has a purpose and is worth saving, which moves Charles, and thereafter they strike up a friendship. That relationship will bring great success for Charles through Seabiscuit. In essence, because Charles had a deep interest and intention getting into horseracing and purchase horses for that purpose, he quickly attracted the man, Tom, who would enable it to happen. 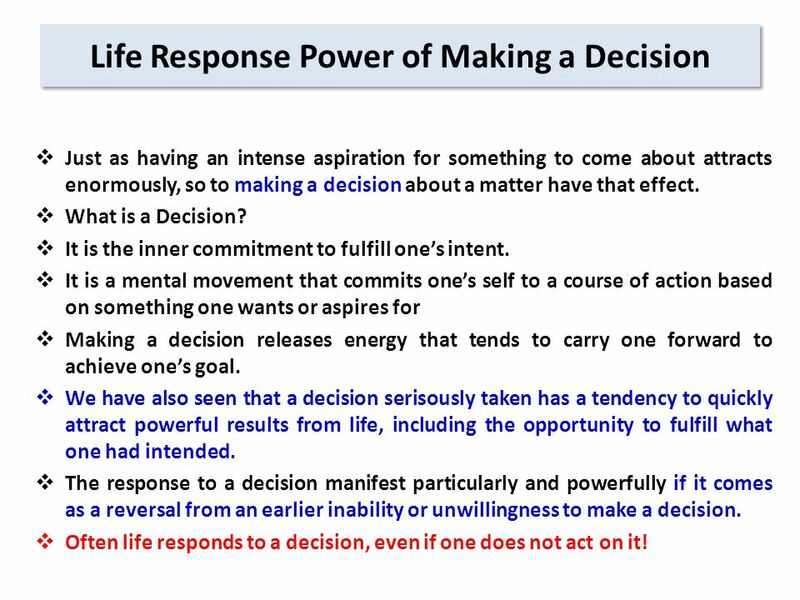 16 Life Response Power of Making a Decision  Just as having an intense aspiration for something to come about attracts enormously, so to making a decision about a matter have that effect.  What is a Decision? 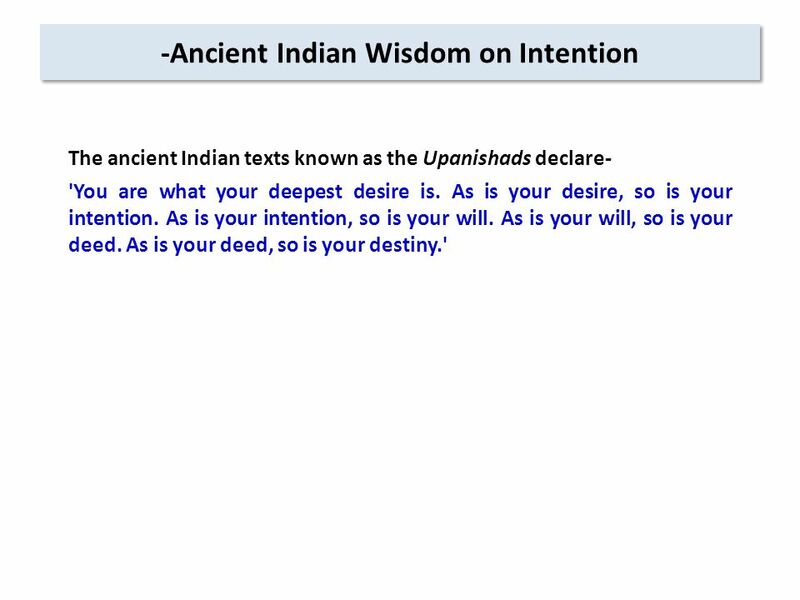  It is the inner commitment to fulfill one’s intent.  It is a mental movement that commits one’s self to a course of action based on something one wants or aspires for  Making a decision releases energy that tends to carry one forward to achieve one’s goal.  We have also seen that a decision serisously taken has a tendency to quickly attract powerful results from life, including the opportunity to fulfill what one had intended.  The response to a decision manifest particularly and powerfully if it comes as a reversal from an earlier inability or unwillingness to make a decision.  Often life responds to a decision, even if one does not act on it! 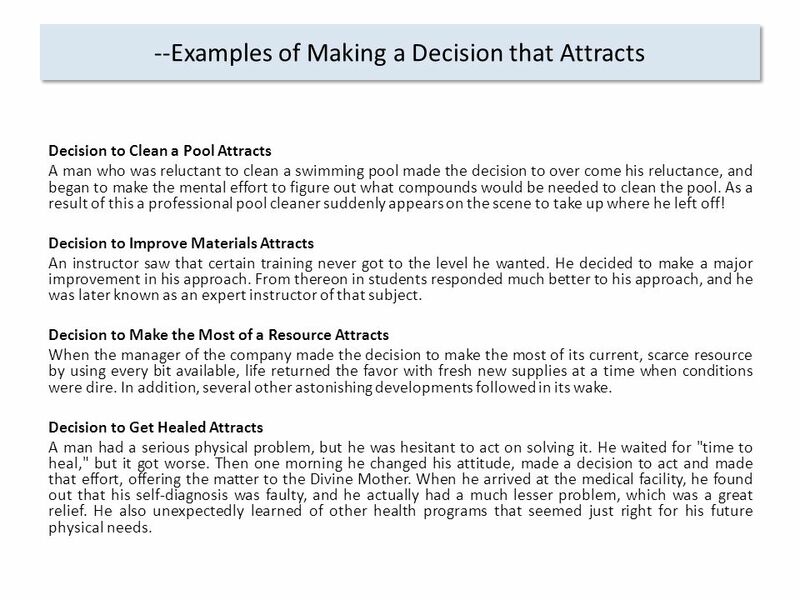 17 --Examples of Making a Decision that Attracts Decision to Clean a Pool Attracts A man who was reluctant to clean a swimming pool made the decision to over come his reluctance, and began to make the mental effort to figure out what compounds would be needed to clean the pool. As a result of this a professional pool cleaner suddenly appears on the scene to take up where he left off! Decision to Improve Materials Attracts An instructor saw that certain training never got to the level he wanted. He decided to make a major improvement in his approach. From thereon in students responded much better to his approach, and he was later known as an expert instructor of that subject. Decision to Make the Most of a Resource Attracts When the manager of the company made the decision to make the most of its current, scarce resource by using every bit available, life returned the favor with fresh new supplies at a time when conditions were dire. In addition, several other astonishing developments followed in its wake. Decision to Get Healed Attracts A man had a serious physical problem, but he was hesitant to act on solving it. He waited for "time to heal," but it got worse. Then one morning he changed his attitude, made a decision to act and made that effort, offering the matter to the Divine Mother. When he arrived at the medical facility, he found out that his self-diagnosis was faulty, and he actually had a much lesser problem, which was a great relief. He also unexpectedly learned of other health programs that seemed just right for his future physical needs. 19 --Decision to Make Rain Come Elicits that Result The following is a somewhat supernatural story. 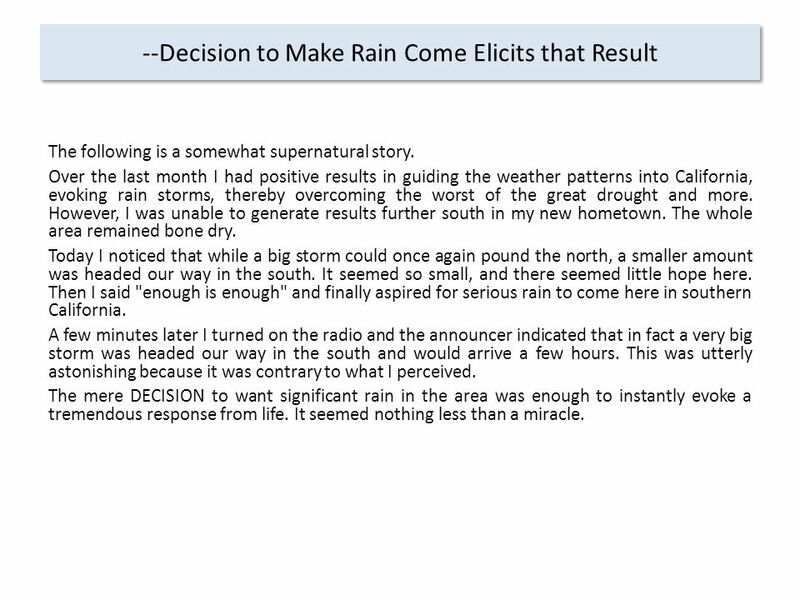 Over the last month I had positive results in guiding the weather patterns into California, evoking rain storms, thereby overcoming the worst of the great drought and more. However, I was unable to generate results further south in my new hometown. The whole area remained bone dry. Today I noticed that while a big storm could once again pound the north, a smaller amount was headed our way in the south. It seemed so small, and there seemed little hope here. Then I said "enough is enough" and finally aspired for serious rain to come here in southern California. A few minutes later I turned on the radio and the announcer indicated that in fact a very big storm was headed our way in the south and would arrive a few hours. This was utterly astonishing because it was contrary to what I perceived. The mere DECISION to want significant rain in the area was enough to instantly evoke a tremendous response from life. It seemed nothing less than a miracle. 20 Following the Process of Accomplishment  So far we have seen two elements related to accomplishing something that attract: Having an Intention and Making a Decision  In researching the process over the years we have actually identified a half dozen elements that work in tandem to generate, success  They are:  Intention  Will  Decision  Commitment  Right Strategies  Execution/Action  With right attitudes and skills  We have seen that if we follow and fulfill these factors, we will attract overwhelming, even life changing life response results! 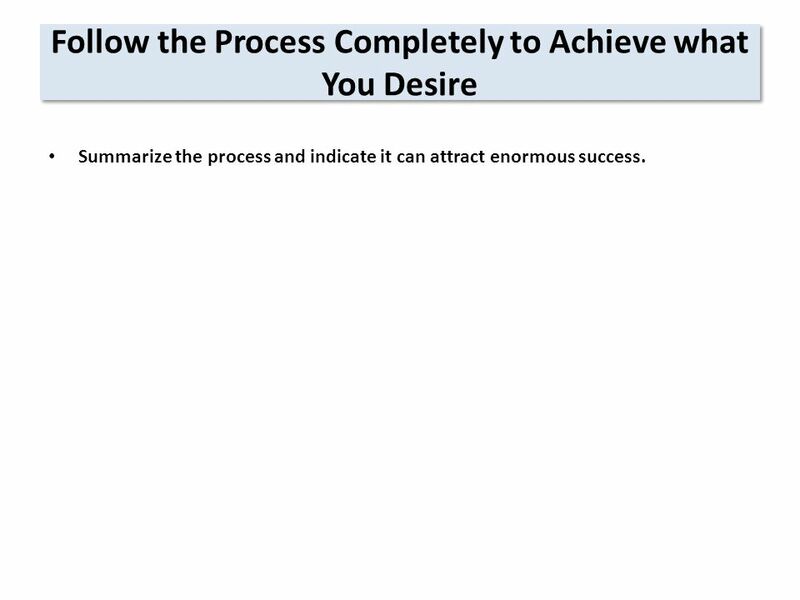 22 Follow the Process Completely to Achieve what You Desire Summarize the process and indicate it can attract enormous success. 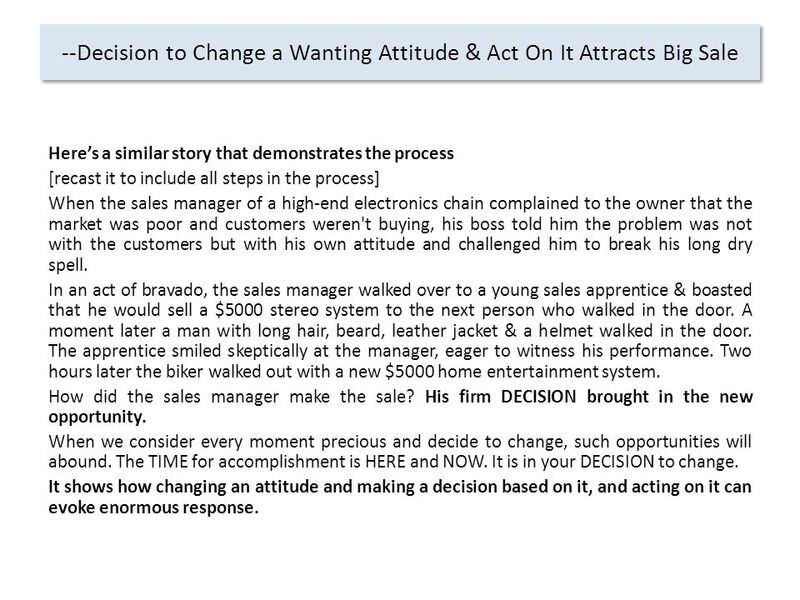 23 --Decision to Change a Wanting Attitude & Act On It Attracts Big Sale Here’s a similar story that demonstrates the process [recast it to include all steps in the process] When the sales manager of a high-end electronics chain complained to the owner that the market was poor and customers weren't buying, his boss told him the problem was not with the customers but with his own attitude and challenged him to break his long dry spell. In an act of bravado, the sales manager walked over to a young sales apprentice & boasted that he would sell a $5000 stereo system to the next person who walked in the door. A moment later a man with long hair, beard, leather jacket & a helmet walked in the door. The apprentice smiled skeptically at the manager, eager to witness his performance. Two hours later the biker walked out with a new $5000 home entertainment system. How did the sales manager make the sale? His firm DECISION brought in the new opportunity. When we consider every moment precious and decide to change, such opportunities will abound. The TIME for accomplishment is HERE and NOW. It is in your DECISION to change. It shows how changing an attitude and making a decision based on it, and acting on it can evoke enormous response. 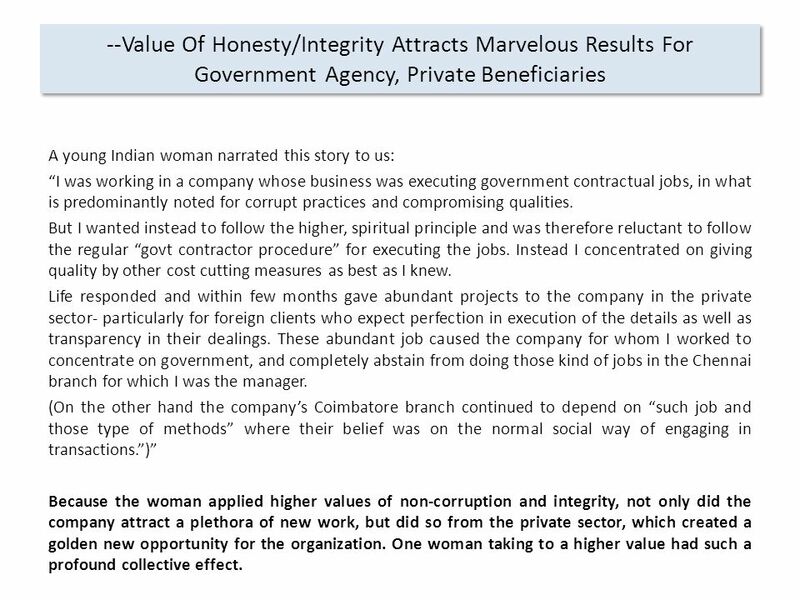 26 --Value Of Honesty/Integrity Attracts Marvelous Results For Government Agency, Private Beneficiaries A young Indian woman narrated this story to us: “I was working in a company whose business was executing government contractual jobs, in what is predominantly noted for corrupt practices and compromising qualities. But I wanted instead to follow the higher, spiritual principle and was therefore reluctant to follow the regular “govt contractor procedure” for executing the jobs. Instead I concentrated on giving quality by other cost cutting measures as best as I knew. Life responded and within few months gave abundant projects to the company in the private sector- particularly for foreign clients who expect perfection in execution of the details as well as transparency in their dealings. These abundant job caused the company for whom I worked to concentrate on government, and completely abstain from doing those kind of jobs in the Chennai branch for which I was the manager. (On the other hand the company’s Coimbatore branch continued to depend on “such job and those type of methods” where their belief was on the normal social way of engaging in transactions.”)” Because the woman applied higher values of non-corruption and integrity, not only did the company attract a plethora of new work, but did so from the private sector, which created a golden new opportunity for the organization. One woman taking to a higher value had such a profound collective effect. 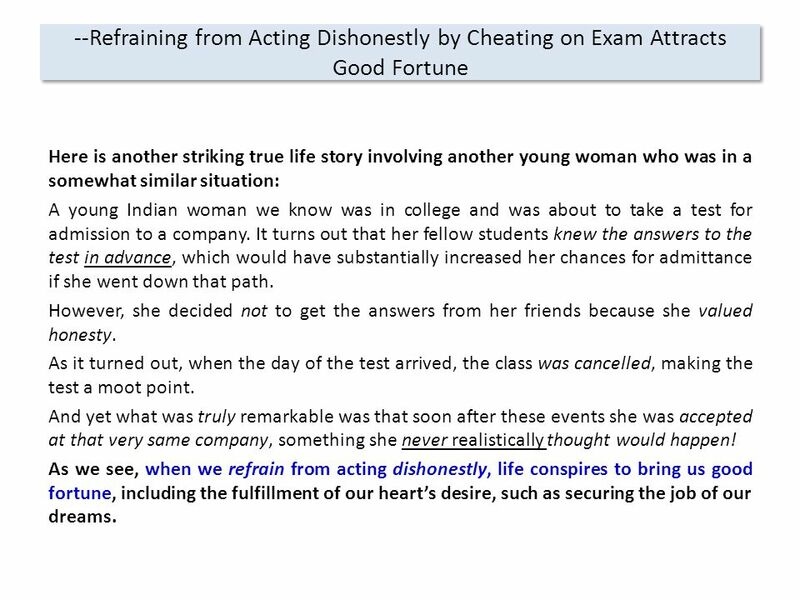 27 --Refraining from Acting Dishonestly by Cheating on Exam Attracts Good Fortune Here is another striking true life story involving another young woman who was in a somewhat similar situation: A young Indian woman we know was in college and was about to take a test for admission to a company. It turns out that her fellow students knew the answers to the test in advance, which would have substantially increased her chances for admittance if she went down that path. However, she decided not to get the answers from her friends because she valued honesty. As it turned out, when the day of the test arrived, the class was cancelled, making the test a moot point. And yet what was truly remarkable was that soon after these events she was accepted at that very same company, something she never realistically thought would happen! As we see, when we refrain from acting dishonestly, life conspires to bring us good fortune, including the fulfillment of our heart’s desire, such as securing the job of our dreams. 28 --Power of Higher Values of Keeping One’s Word, Doing the Right Thing Attract Doubling of Business [to be included] Payments are getting delayed now days from almost all clients owing to decline in exports and general electricity problem prevailing in all industrial areas. Even blue chip companies are asking for 60 to 90 days credit-whereas I have to get materials on 100% D.D. This is constantly keeping me in financial crunch and tense. I had to honour a cheque last week. Somebody suggested taking the “tipping” route to the Finance Managers to get the payments at the... earliest. As all payments, rentals, instalments, salaries - were so important to be honoured - to keep my name “as prompt payer”” I also followed what others have done, tipped...got payments and felt happy that I kept my word. In the process I went back - to corrupt practices – lost opportunity to evolve as well as going away from Mother. But next time when same thing happened after few months. I resisted the temptation to do that –particularly in a curiosity to see what happens if we stick to principle than “good name / reputation” of keeping the words, paying in right time, etc. The day came, nothing happened and the cheque got bounced. I am writing it easily now with a smile. But that day was most torturous one emotionally, feeling desolated, dejected and humiliated. I even felt as if every body is speaking about me and about my default to the point of not coming outside, completely shattering inside, even losing faith on “Mother” and Her ways. I got money next day-took D.D and met the G.M. of that company - In course of conversation he found my erudition and introduced me to a marketing person to make use of me for the new product they are going to introduce for premium sector –for which they need a distributor who is cogent and pertinent. This is an international company – and normally appointment with G.M –finance will not be given for any vendors unless it is an utmost necessity not to say about appointment with the product manager from whom I got many practical tips on technical aspects and opening up a new opportunity in business that I never knew that exists. Now my turn over is two times the last year. 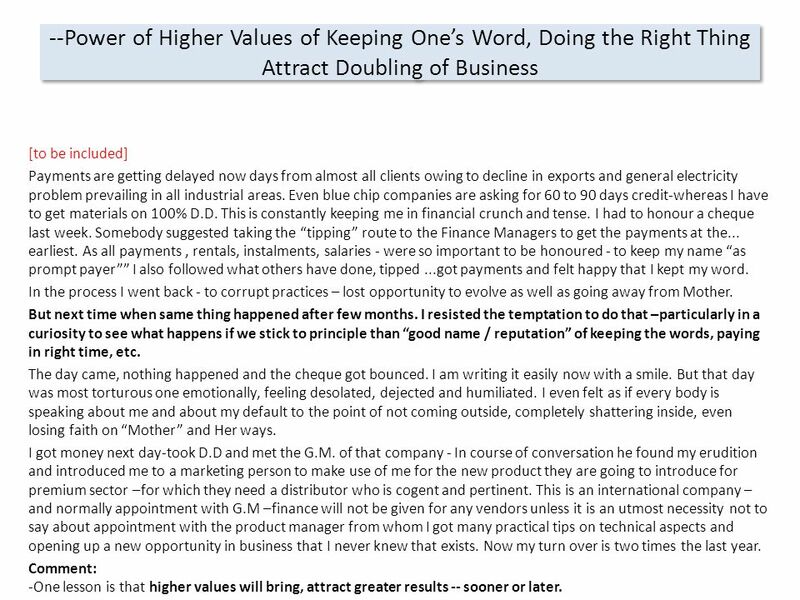 Comment: -One lesson is that higher values will bring, attract greater results -- sooner or later. 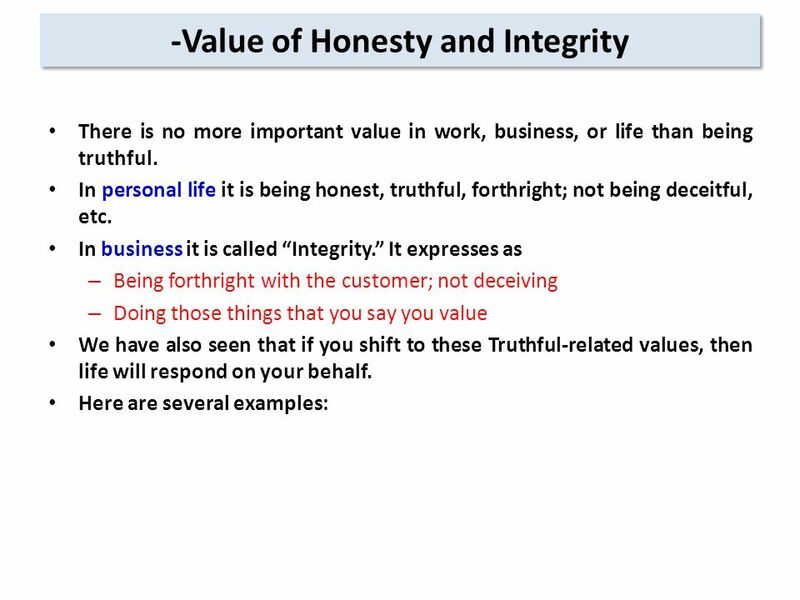 29 --Dishonesty and Deception Leads to Negative Life Response Now let’s consider the absence of such values as honesty and integrity. There is a well-known statement that “dishonesty attracts an ever-widening circle of problems.” Let’s see an example of that and how life responds negatively to lack of truthfulness.. There was an attorney whose practice was faltering, and he was desperate to shield his family from the problem. One day the attorney convinces a judge that the court should make him the guardian of his client who is suffering from dementia, and thereby receive a stipend of $1500 a month. 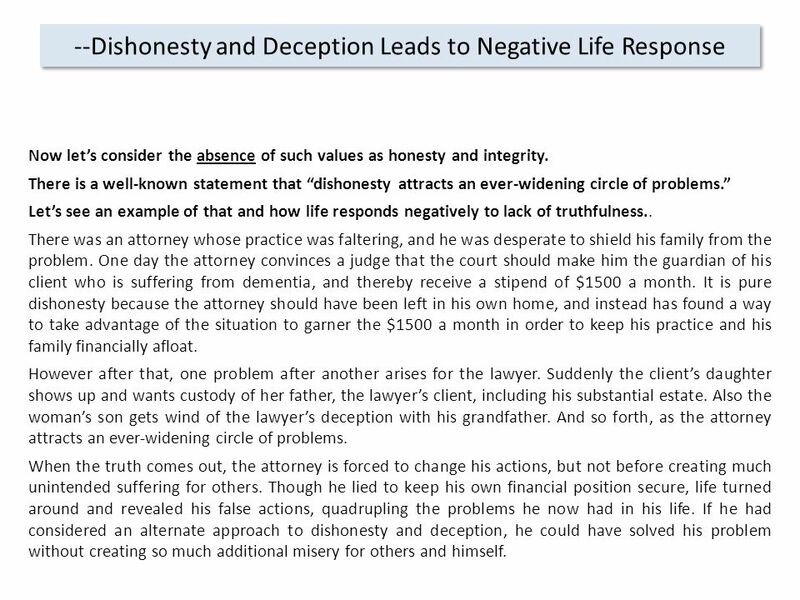 It is pure dishonesty because the attorney should have been left in his own home, and instead has found a way to take advantage of the situation to garner the $1500 a month in order to keep his practice and his family financially afloat. However after that, one problem after another arises for the lawyer. Suddenly the client’s daughter shows up and wants custody of her father, the lawyer’s client, including his substantial estate. 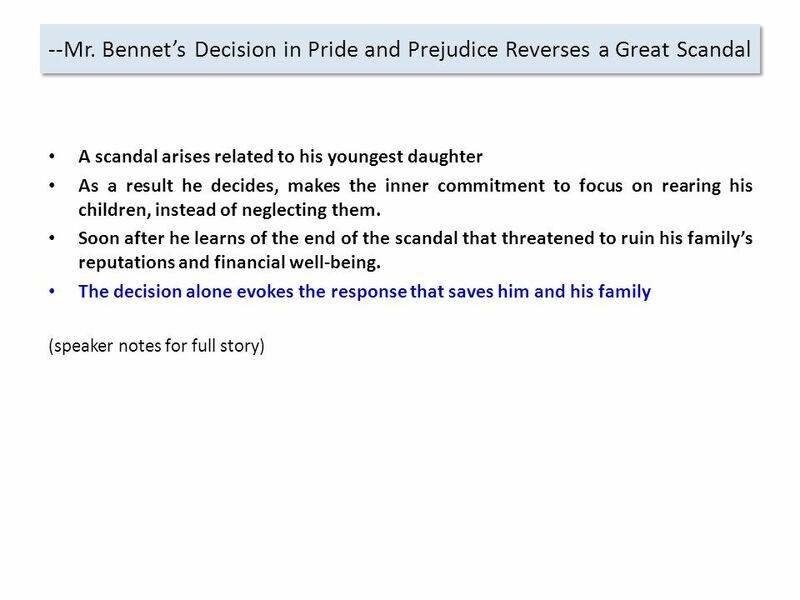 Also the woman’s son gets wind of the lawyer’s deception with his grandfather. And so forth, as the attorney attracts an ever-widening circle of problems. When the truth comes out, the attorney is forced to change his actions, but not before creating much unintended suffering for others. Though he lied to keep his own financial position secure, life turned around and revealed his false actions, quadrupling the problems he now had in his life. If he had considered an alternate approach to dishonesty and deception, he could have solved his problem without creating so much additional misery for others and himself. 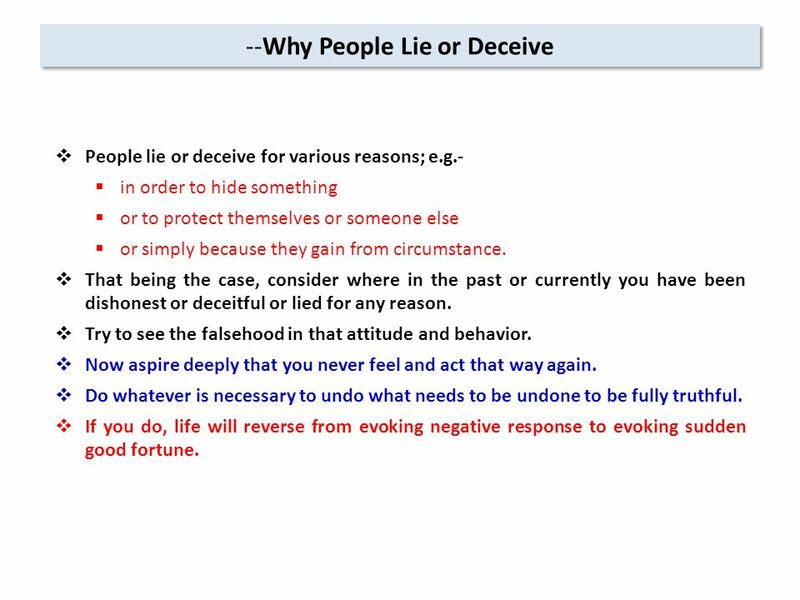 30 --Why People Lie or Deceive  People lie or deceive for various reasons; e.g.-  in order to hide something  or to protect themselves or someone else  or simply because they gain from circumstance.  That being the case, consider where in the past or currently you have been dishonest or deceitful or lied for any reason.  Try to see the falsehood in that attitude and behavior.  Now aspire deeply that you never feel and act that way again.  Do whatever is necessary to undo what needs to be undone to be fully truthful.  If you do, life will reverse from evoking negative response to evoking sudden good fortune. 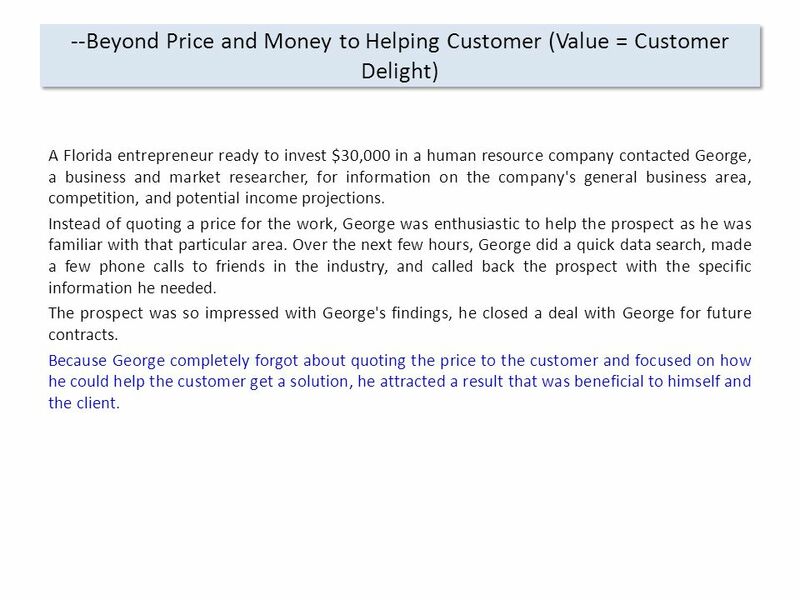 32 --Beyond Price and Money to Helping Customer (Value = Customer Delight) A Florida entrepreneur ready to invest $30,000 in a human resource company contacted George, a business and market researcher, for information on the company's general business area, competition, and potential income projections. Instead of quoting a price for the work, George was enthusiastic to help the prospect as he was familiar with that particular area. Over the next few hours, George did a quick data search, made a few phone calls to friends in the industry, and called back the prospect with the specific information he needed. The prospect was so impressed with George's findings, he closed a deal with George for future contracts. Because George completely forgot about quoting the price to the customer and focused on how he could help the customer get a solution, he attracted a result that was beneficial to himself and the client. 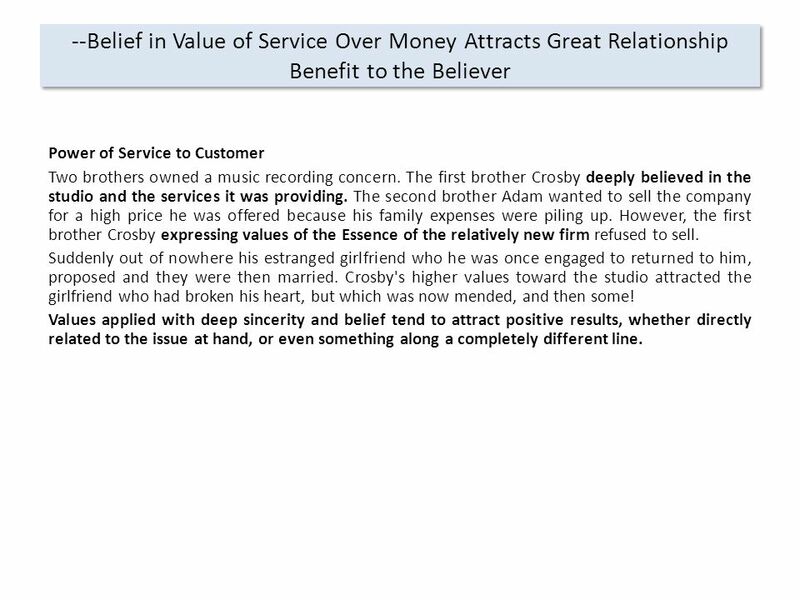 33 --Belief in Value of Service Over Money Attracts Great Relationship Benefit to the Believer Power of Service to Customer Two brothers owned a music recording concern. The first brother Crosby deeply believed in the studio and the services it was providing. The second brother Adam wanted to sell the company for a high price he was offered because his family expenses were piling up. However, the first brother Crosby expressing values of the Essence of the relatively new firm refused to sell. Suddenly out of nowhere his estranged girlfriend who he was once engaged to returned to him, proposed and they were then married. Crosby's higher values toward the studio attracted the girlfriend who had broken his heart, but which was now mended, and then some! 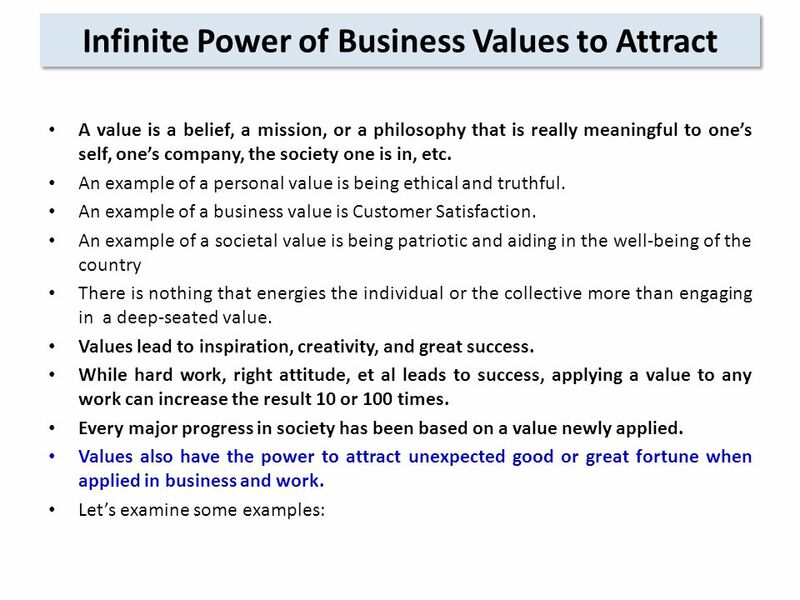 Values applied with deep sincerity and belief tend to attract positive results, whether directly related to the issue at hand, or even something along a completely different line. 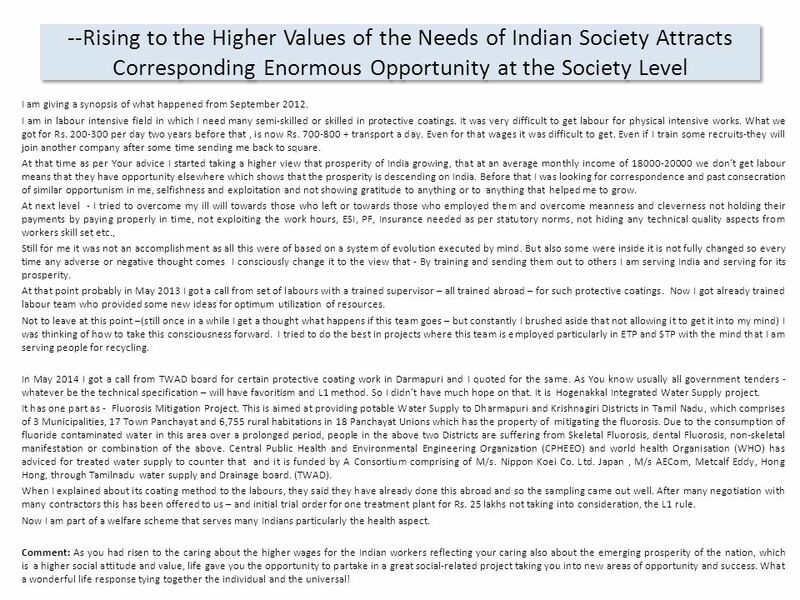 34 --Rising to the Higher Values of the Needs of Indian Society Attracts Corresponding Enormous Opportunity at the Society Level I am giving a synopsis of what happened from September 2012. I am in labour intensive field in which I need many semi-skilled or skilled in protective coatings. It was very difficult to get labour for physical intensive works. What we got for Rs. 200-300 per day two years before that, is now Rs. 700-800 + transport a day. Even for that wages it was difficult to get. Even if I train some recruits-they will join another company after some time sending me back to square. At that time as per Your advice I started taking a higher view that prosperity of India growing, that at an average monthly income of 18000-20000 we don’t get labour means that they have opportunity elsewhere which shows that the prosperity is descending on India. Before that I was looking for correspondence and past consecration of similar opportunism in me, selfishness and exploitation and not showing gratitude to anything or to anything that helped me to grow. At next level - I tried to overcome my ill will towards those who left or towards those who employed them and overcome meanness and cleverness not holding their payments by paying properly in time, not exploiting the work hours, ESI, PF, Insurance needed as per statutory norms, not hiding any technical quality aspects from workers skill set etc., Still for me it was not an accomplishment as all this were of based on a system of evolution executed by mind. But also some were inside it is not fully changed so every time any adverse or negative thought comes I consciously change it to the view that - By training and sending them out to others I am serving India and serving for its prosperity. At that point probably in May 2013 I got a call from set of labours with a trained supervisor – all trained abroad – for such protective coatings. Now I got already trained labour team who provided some new ideas for optimum utilization of resources. Not to leave at this point –(still once in a while I get a thought what happens if this team goes – but constantly I brushed aside that not allowing it to get it into my mind) I was thinking of how to take this consciousness forward. I tried to do the best in projects where this team is employed particularly in ETP and STP with the mind that I am serving people for recycling. In May 2014 I got a call from TWAD board for certain protective coating work in Darmapuri and I quoted for the same. 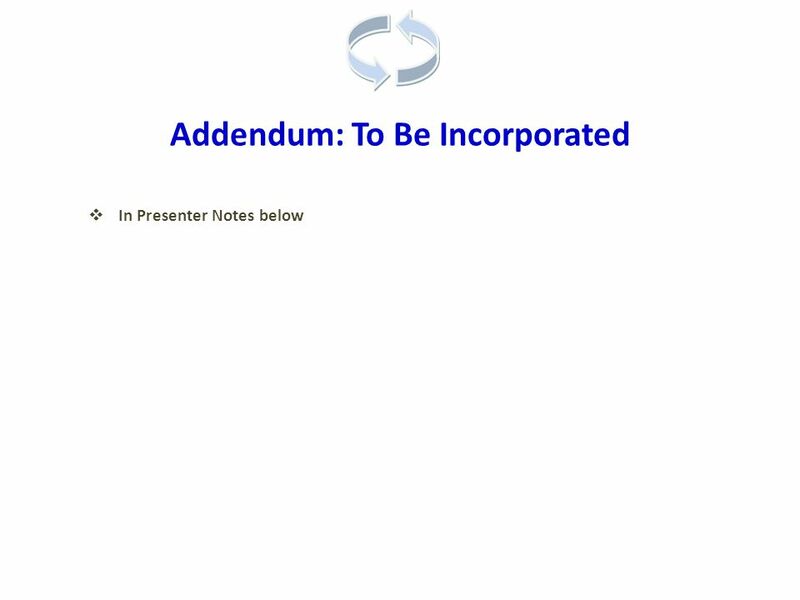 As You know usually all government tenders - whatever be the technical specification – will have favoritism and L1 method. So I didn’t have much hope on that. It is Hogenakkal Integrated Water Supply project. It has one part as - Fluorosis Mitigation Project. This is aimed at providing potable Water Supply to Dharmapuri and Krishnagiri Districts in Tamil Nadu, which comprises of 3 Municipalities, 17 Town Panchayat and 6,755 rural habitations in 18 Panchayat Unions which has the property of mitigating the fluorosis. Due to the consumption of fluoride contaminated water in this area over a prolonged period, people in the above two Districts are suffering from Skeletal Fluorosis, dental Fluorosis, non-skeletal manifestation or combination of the above. Central Public Health and Environmental Engineering Organization (CPHEEO) and world health Organisation (WHO) has adviced for treated water supply to counter that and it is funded by A Consortium comprising of M/s. Nippon Koei Co. Ltd. Japan, M/s AECom, Metcalf Eddy, Hong Hong, through Tamilnadu water supply and Drainage board. (TWAD). When I explained about its coating method to the labours, they said they have already done this abroad and so the sampling came out well. After many negotiation with many contractors this has been offered to us – and initial trial order for one treatment plant for Rs. 25 lakhs not taking into consideration, the L1 rule. Now I am part of a welfare scheme that serves many Indians particularly the health aspect. Comment: As you had risen to the caring about the higher wages for the Indian workers reflecting your caring also about the emerging prosperity of the nation, which is a higher social attitude and value, life gave you the opportunity to partake in a great social-related project taking you into new areas of opportunity and success. What a wonderful life response tying together the individual and the universal! 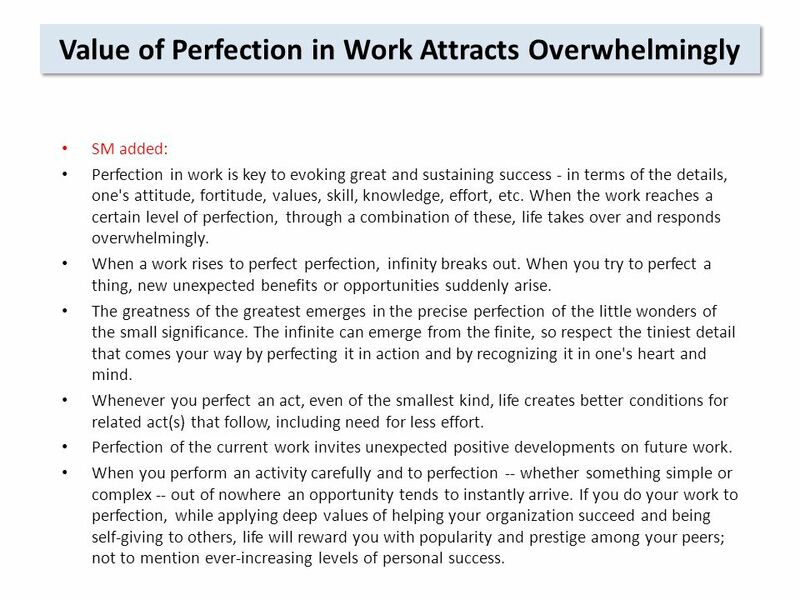 39 Value of Perfection in Work Attracts Overwhelmingly SM added: Perfection in work is key to evoking great and sustaining success - in terms of the details, one's attitude, fortitude, values, skill, knowledge, effort, etc. When the work reaches a certain level of perfection, through a combination of these, life takes over and responds overwhelmingly. When a work rises to perfect perfection, infinity breaks out. When you try to perfect a thing, new unexpected benefits or opportunities suddenly arise. The greatness of the greatest emerges in the precise perfection of the little wonders of the small significance. The infinite can emerge from the finite, so respect the tiniest detail that comes your way by perfecting it in action and by recognizing it in one's heart and mind. Whenever you perfect an act, even of the smallest kind, life creates better conditions for related act(s) that follow, including need for less effort. Perfection of the current work invites unexpected positive developments on future work. When you perform an activity carefully and to perfection -- whether something simple or complex -- out of nowhere an opportunity tends to instantly arrive. If you do your work to perfection, while applying deep values of helping your organization succeed and being self-giving to others, life will reward you with popularity and prestige among your peers; not to mention ever-increasing levels of personal success. 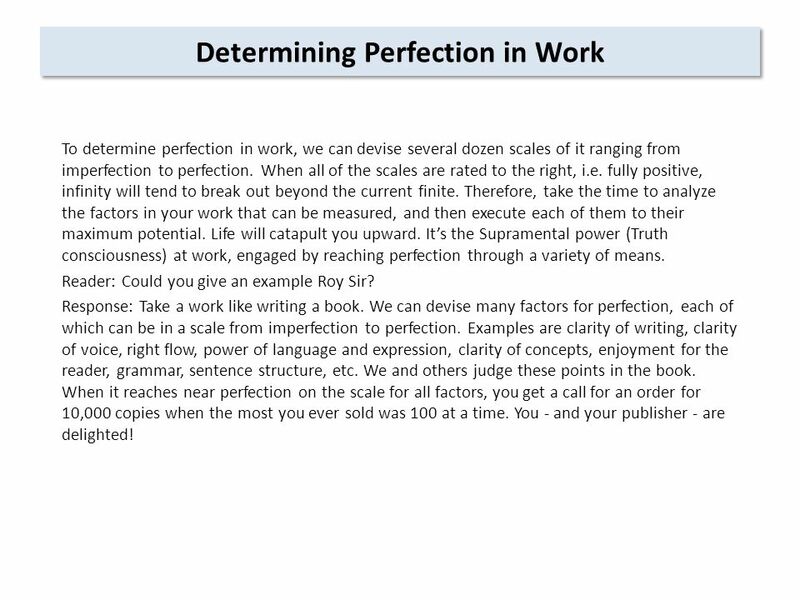 40 Determining Perfection in Work To determine perfection in work, we can devise several dozen scales of it ranging from imperfection to perfection. When all of the scales are rated to the right, i.e. fully positive, infinity will tend to break out beyond the current finite. Therefore, take the time to analyze the factors in your work that can be measured, and then execute each of them to their maximum potential. Life will catapult you upward. It’s the Supramental power (Truth consciousness) at work, engaged by reaching perfection through a variety of means. Reader: Could you give an example Roy Sir? Response: Take a work like writing a book. We can devise many factors for perfection, each of which can be in a scale from imperfection to perfection. Examples are clarity of writing, clarity of voice, right flow, power of language and expression, clarity of concepts, enjoyment for the reader, grammar, sentence structure, etc. We and others judge these points in the book. When it reaches near perfection on the scale for all factors, you get a call for an order for 10,000 copies when the most you ever sold was 100 at a time. You - and your publisher - are delighted! 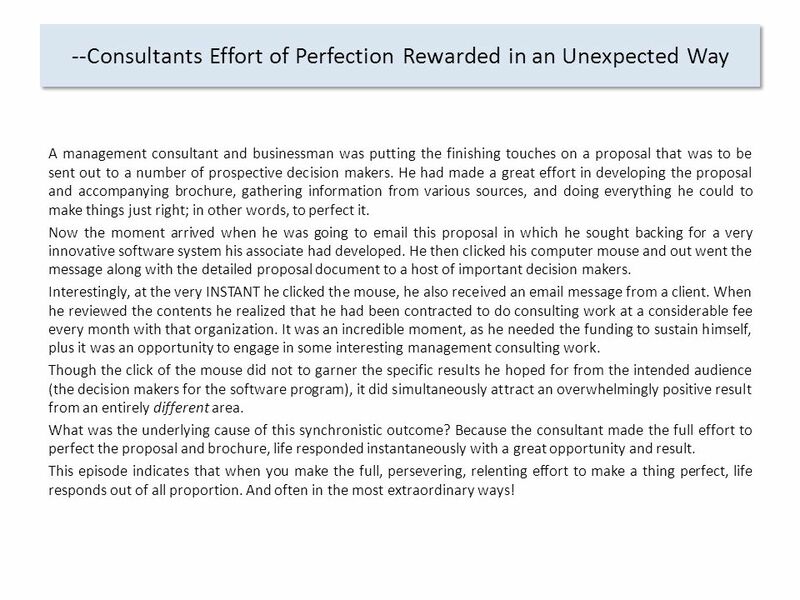 42 --Consultants Effort of Perfection Rewarded in an Unexpected Way A management consultant and businessman was putting the finishing touches on a proposal that was to be sent out to a number of prospective decision makers. He had made a great effort in developing the proposal and accompanying brochure, gathering information from various sources, and doing everything he could to make things just right; in other words, to perfect it. Now the moment arrived when he was going to email this proposal in which he sought backing for a very innovative software system his associate had developed. He then clicked his computer mouse and out went the message along with the detailed proposal document to a host of important decision makers. Interestingly, at the very INSTANT he clicked the mouse, he also received an email message from a client. When he reviewed the contents he realized that he had been contracted to do consulting work at a considerable fee every month with that organization. It was an incredible moment, as he needed the funding to sustain himself, plus it was an opportunity to engage in some interesting management consulting work. Though the click of the mouse did not to garner the specific results he hoped for from the intended audience (the decision makers for the software program), it did simultaneously attract an overwhelmingly positive result from an entirely different area. What was the underlying cause of this synchronistic outcome? Because the consultant made the full effort to perfect the proposal and brochure, life responded instantaneously with a great opportunity and result. This episode indicates that when you make the full, persevering, relenting effort to make a thing perfect, life responds out of all proportion. And often in the most extraordinary ways! 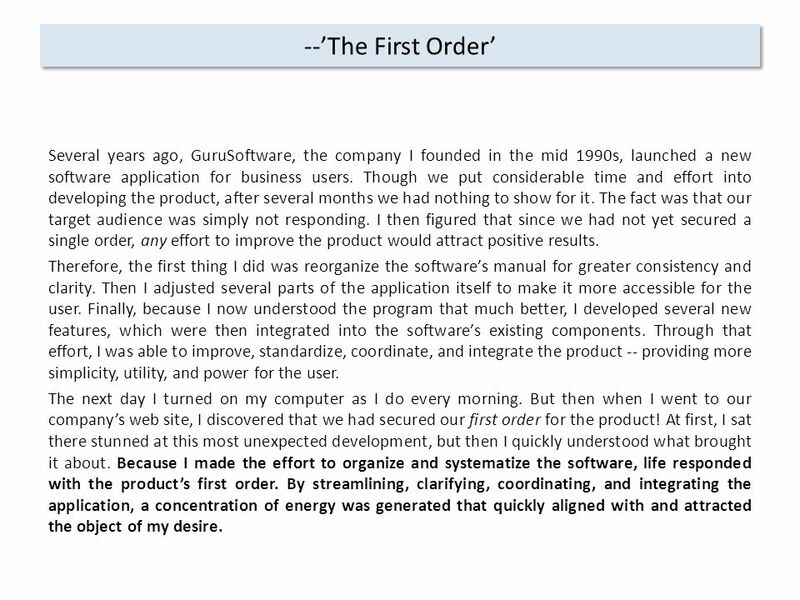 43 --’The First Order’ Several years ago, GuruSoftware, the company I founded in the mid 1990s, launched a new software application for business users. Though we put considerable time and effort into developing the product, after several months we had nothing to show for it. The fact was that our target audience was simply not responding. I then figured that since we had not yet secured a single order, any effort to improve the product would attract positive results. Therefore, the first thing I did was reorganize the software’s manual for greater consistency and clarity. Then I adjusted several parts of the application itself to make it more accessible for the user. Finally, because I now understood the program that much better, I developed several new features, which were then integrated into the software’s existing components. Through that effort, I was able to improve, standardize, coordinate, and integrate the product -- providing more simplicity, utility, and power for the user. The next day I turned on my computer as I do every morning. But then when I went to our company’s web site, I discovered that we had secured our first order for the product! At first, I sat there stunned at this most unexpected development, but then I quickly understood what brought it about. Because I made the effort to organize and systematize the software, life responded with the product’s first order. By streamlining, clarifying, coordinating, and integrating the application, a concentration of energy was generated that quickly aligned with and attracted the object of my desire. 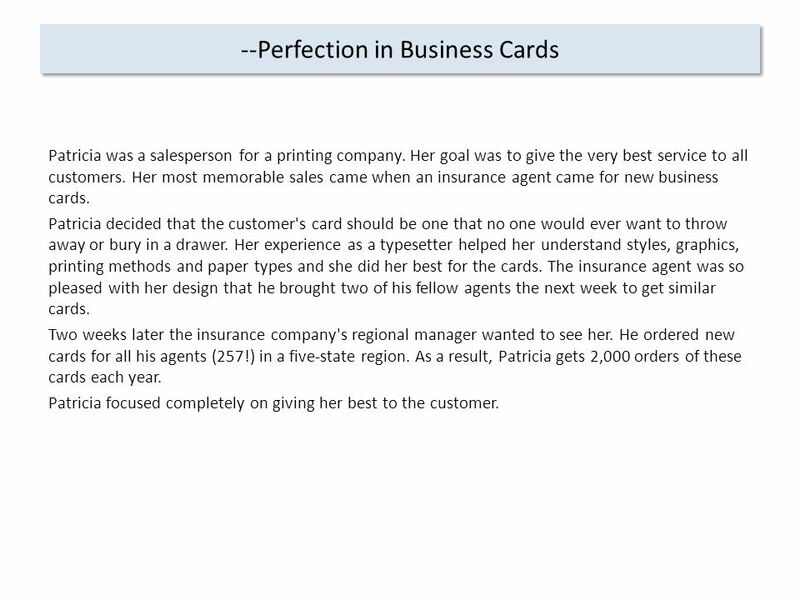 44 --Perfection in Business Cards Patricia was a salesperson for a printing company. Her goal was to give the very best service to all customers. Her most memorable sales came when an insurance agent came for new business cards. Patricia decided that the customer's card should be one that no one would ever want to throw away or bury in a drawer. Her experience as a typesetter helped her understand styles, graphics, printing methods and paper types and she did her best for the cards. The insurance agent was so pleased with her design that he brought two of his fellow agents the next week to get similar cards. Two weeks later the insurance company's regional manager wanted to see her. He ordered new cards for all his agents (257!) in a five-state region. As a result, Patricia gets 2,000 orders of these cards each year. Patricia focused completely on giving her best to the customer. 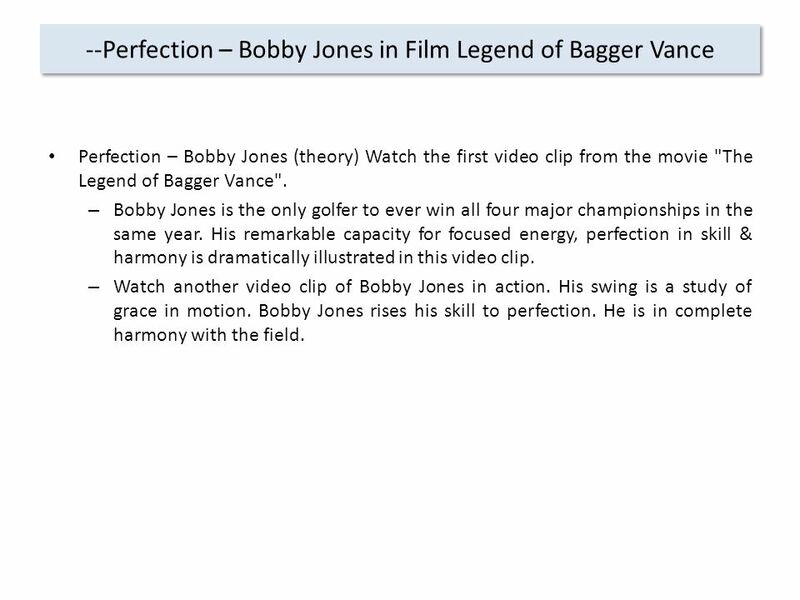 45 --Perfection – Bobby Jones in Film Legend of Bagger Vance Perfection – Bobby Jones (theory) Watch the first video clip from the movie "The Legend of Bagger Vance". – Bobby Jones is the only golfer to ever win all four major championships in the same year. His remarkable capacity for focused energy, perfection in skill & harmony is dramatically illustrated in this video clip. – Watch another video clip of Bobby Jones in action. His swing is a study of grace in motion. Bobby Jones rises his skill to perfection. He is in complete harmony with the field. 46 --Task Breakdown and Sequence Breakdown Attracts the Book The other day I was on my way out of a mega bookstore after reading a few articles and looking at a book I was considering to purchase. However, before leaving I needed to put a magazine and a book back to their original locations. Normally, I would just go ahead and do that quite unconsciously, without distinguishing the components of the task very much, if at all. This time however, I decided to think about each thing I had to do, and what order to do them in. 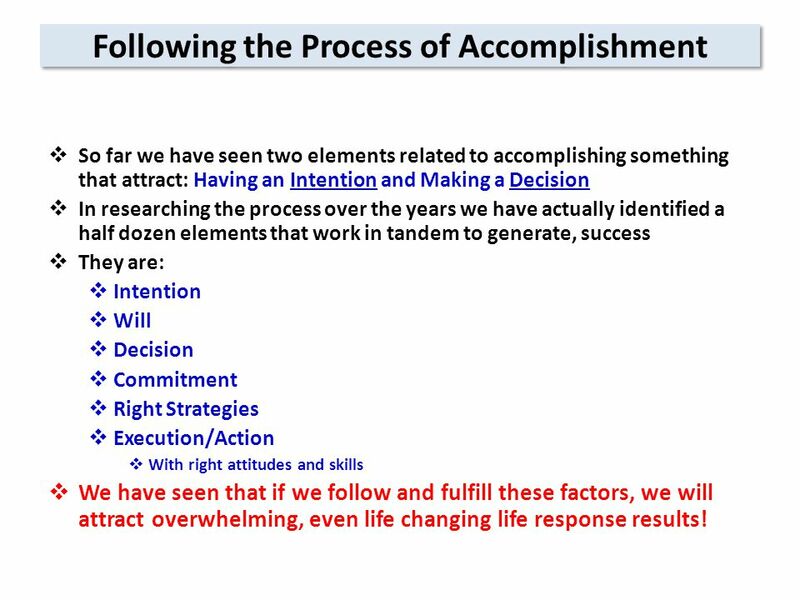 In other words, I was breaking down the while into its constituent components, and then setting about meticulously focusing on and accomplishing each. I then rode down the escalator with the intention of first returning the book, and then taking care of the magazine. Interestingly, when I came down to the plethora of book shelves, I immediately saw a duplicate of the orange book I was holding in my hand. I therefore knew precisely where to return the book. This was startling to me since there were thousands of books in the area, yet this one stood out amongst all, guiding me to the precise place to return the book. I later understand the principle behind what had happened. Because I broke down an normally unconscious act into its constituent components and then devised a sequence to accomplish each, I attracted a result that overcame the necessity of looking and hunting for the return location. 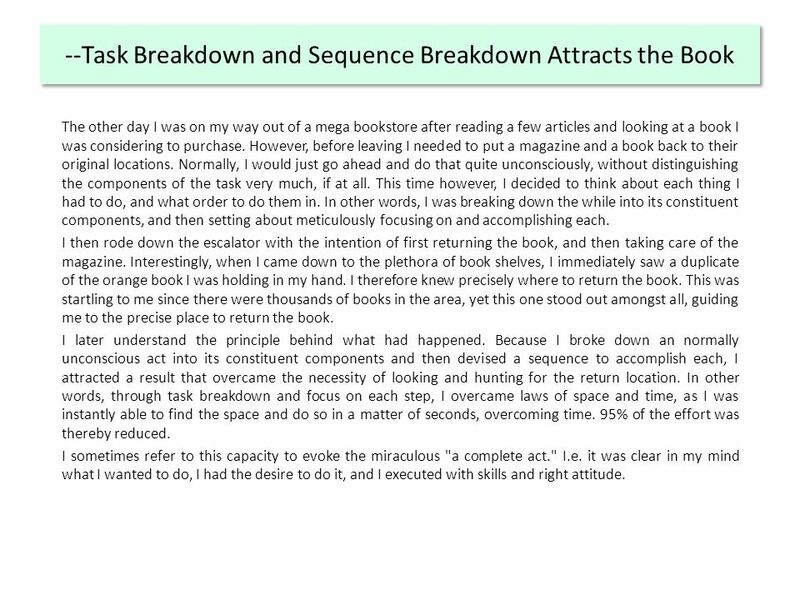 In other words, through task breakdown and focus on each step, I overcame laws of space and time, as I was instantly able to find the space and do so in a matter of seconds, overcoming time. 95% of the effort was thereby reduced. I sometimes refer to this capacity to evoke the miraculous "a complete act." I.e. it was clear in my mind what I wanted to do, I had the desire to do it, and I executed with skills and right attitude. 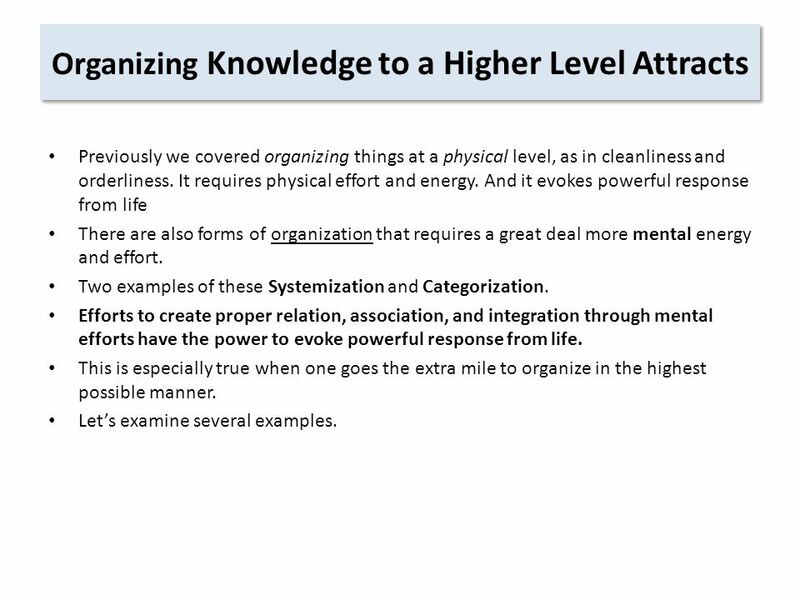 47 Organizing Knowledge to a Higher Level Attracts Previously we covered organizing things at a physical level, as in cleanliness and orderliness. It requires physical effort and energy. And it evokes powerful response from life There are also forms of organization that requires a great deal more mental energy and effort. 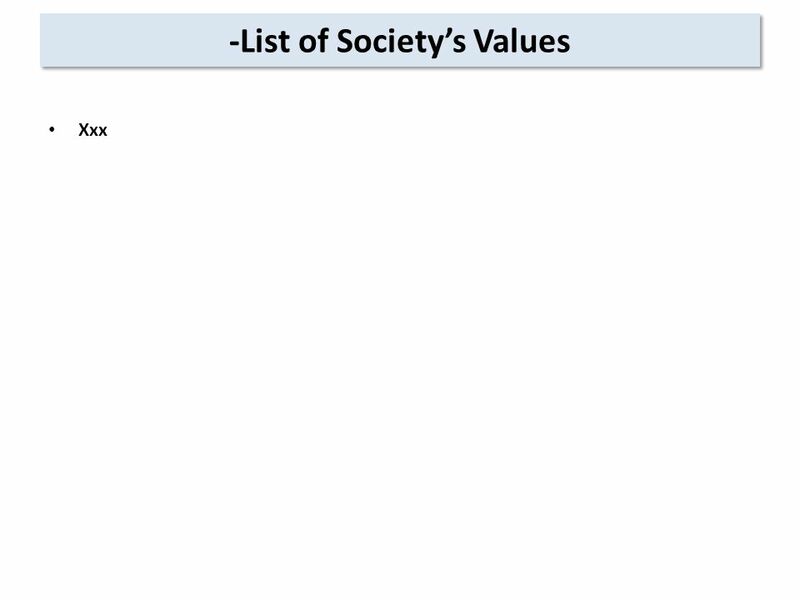 Two examples of these Systemization and Categorization. Efforts to create proper relation, association, and integration through mental efforts have the power to evoke powerful response from life. This is especially true when one goes the extra mile to organize in the highest possible manner. Let’s examine several examples. 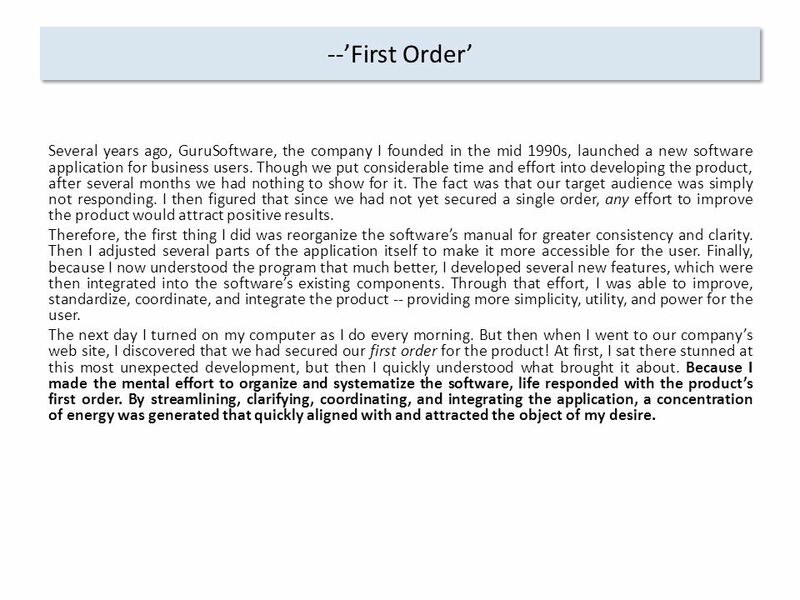 48 --’First Order’ Several years ago, GuruSoftware, the company I founded in the mid 1990s, launched a new software application for business users. Though we put considerable time and effort into developing the product, after several months we had nothing to show for it. The fact was that our target audience was simply not responding. I then figured that since we had not yet secured a single order, any effort to improve the product would attract positive results. Therefore, the first thing I did was reorganize the software’s manual for greater consistency and clarity. Then I adjusted several parts of the application itself to make it more accessible for the user. Finally, because I now understood the program that much better, I developed several new features, which were then integrated into the software’s existing components. Through that effort, I was able to improve, standardize, coordinate, and integrate the product -- providing more simplicity, utility, and power for the user. The next day I turned on my computer as I do every morning. But then when I went to our company’s web site, I discovered that we had secured our first order for the product! At first, I sat there stunned at this most unexpected development, but then I quickly understood what brought it about. Because I made the mental effort to organize and systematize the software, life responded with the product’s first order. By streamlining, clarifying, coordinating, and integrating the application, a concentration of energy was generated that quickly aligned with and attracted the object of my desire. 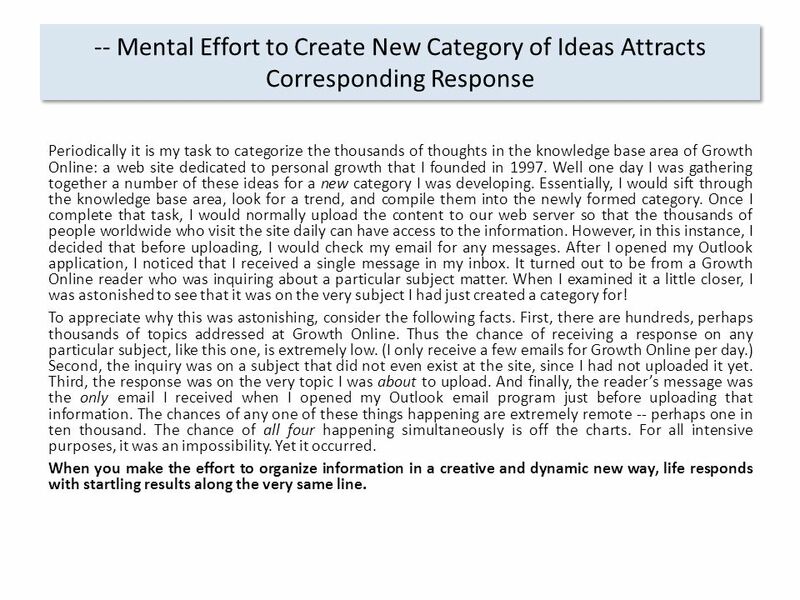 49 -- Mental Effort to Create New Category of Ideas Attracts Corresponding Response Periodically it is my task to categorize the thousands of thoughts in the knowledge base area of Growth Online: a web site dedicated to personal growth that I founded in 1997. Well one day I was gathering together a number of these ideas for a new category I was developing. Essentially, I would sift through the knowledge base area, look for a trend, and compile them into the newly formed category. Once I complete that task, I would normally upload the content to our web server so that the thousands of people worldwide who visit the site daily can have access to the information. However, in this instance, I decided that before uploading, I would check my email for any messages. After I opened my Outlook application, I noticed that I received a single message in my inbox. It turned out to be from a Growth Online reader who was inquiring about a particular subject matter. When I examined it a little closer, I was astonished to see that it was on the very subject I had just created a category for! To appreciate why this was astonishing, consider the following facts. First, there are hundreds, perhaps thousands of topics addressed at Growth Online. Thus the chance of receiving a response on any particular subject, like this one, is extremely low. (I only receive a few emails for Growth Online per day.) Second, the inquiry was on a subject that did not even exist at the site, since I had not uploaded it yet. Third, the response was on the very topic I was about to upload. And finally, the reader’s message was the only email I received when I opened my Outlook email program just before uploading that information. The chances of any one of these things happening are extremely remote -- perhaps one in ten thousand. The chance of all four happening simultaneously is off the charts. For all intensive purposes, it was an impossibility. Yet it occurred. When you make the effort to organize information in a creative and dynamic new way, life responds with startling results along the very same line. 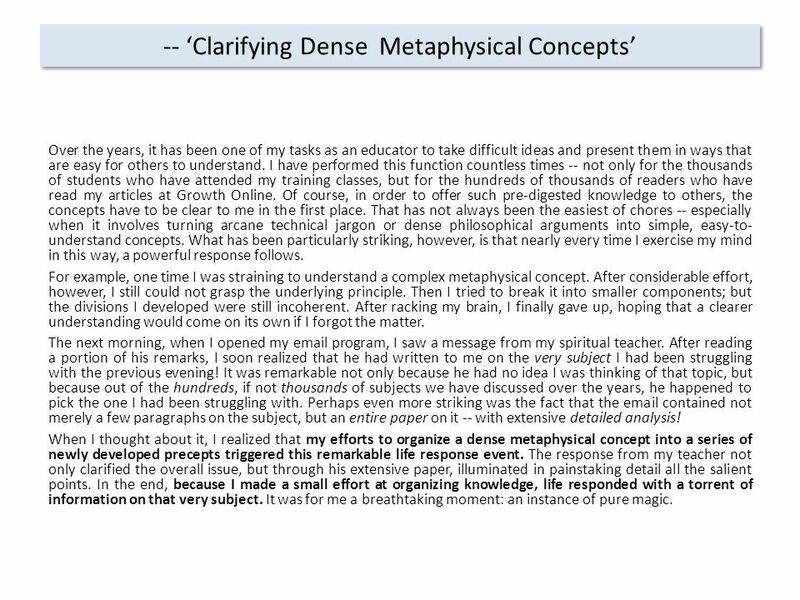 50 -- ‘Clarifying Dense Metaphysical Concepts’ Over the years, it has been one of my tasks as an educator to take difficult ideas and present them in ways that are easy for others to understand. I have performed this function countless times -- not only for the thousands of students who have attended my training classes, but for the hundreds of thousands of readers who have read my articles at Growth Online. Of course, in order to offer such pre-digested knowledge to others, the concepts have to be clear to me in the first place. That has not always been the easiest of chores -- especially when it involves turning arcane technical jargon or dense philosophical arguments into simple, easy-to- understand concepts. What has been particularly striking, however, is that nearly every time I exercise my mind in this way, a powerful response follows. For example, one time I was straining to understand a complex metaphysical concept. After considerable effort, however, I still could not grasp the underlying principle. Then I tried to break it into smaller components; but the divisions I developed were still incoherent. After racking my brain, I finally gave up, hoping that a clearer understanding would come on its own if I forgot the matter. The next morning, when I opened my email program, I saw a message from my spiritual teacher. After reading a portion of his remarks, I soon realized that he had written to me on the very subject I had been struggling with the previous evening! It was remarkable not only because he had no idea I was thinking of that topic, but because out of the hundreds, if not thousands of subjects we have discussed over the years, he happened to pick the one I had been struggling with. Perhaps even more striking was the fact that the email contained not merely a few paragraphs on the subject, but an entire paper on it -- with extensive detailed analysis! 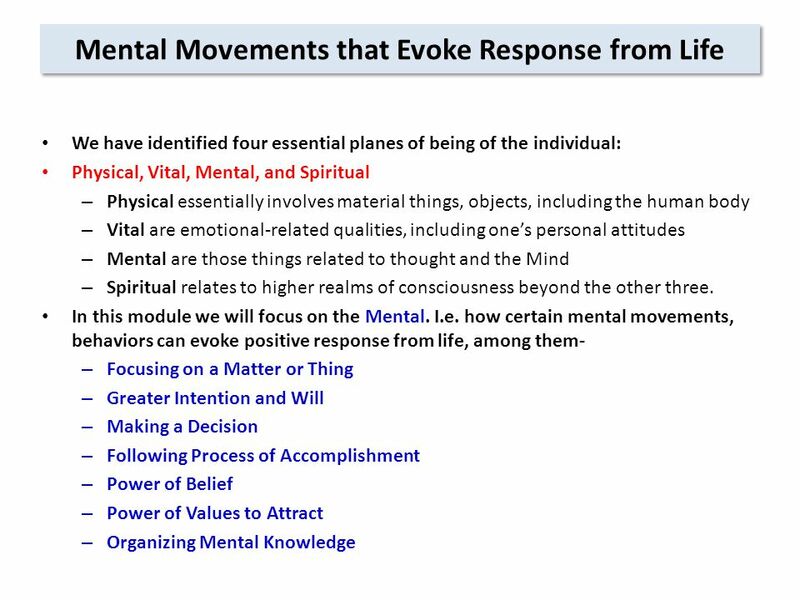 When I thought about it, I realized that my efforts to organize a dense metaphysical concept into a series of newly developed precepts triggered this remarkable life response event. The response from my teacher not only clarified the overall issue, but through his extensive paper, illuminated in painstaking detail all the salient points. In the end, because I made a small effort at organizing knowledge, life responded with a torrent of information on that very subject. It was for me a breathtaking moment: an instance of pure magic. 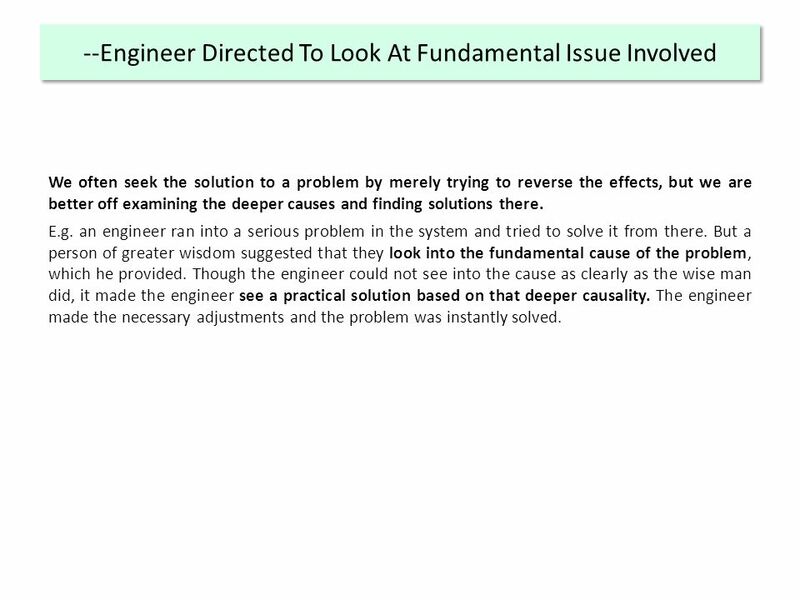 52 --Engineer Directed To Look At Fundamental Issue Involved We often seek the solution to a problem by merely trying to reverse the effects, but we are better off examining the deeper causes and finding solutions there. E.g. an engineer ran into a serious problem in the system and tried to solve it from there. But a person of greater wisdom suggested that they look into the fundamental cause of the problem, which he provided. Though the engineer could not see into the cause as clearly as the wise man did, it made the engineer see a practical solution based on that deeper causality. The engineer made the necessary adjustments and the problem was instantly solved. 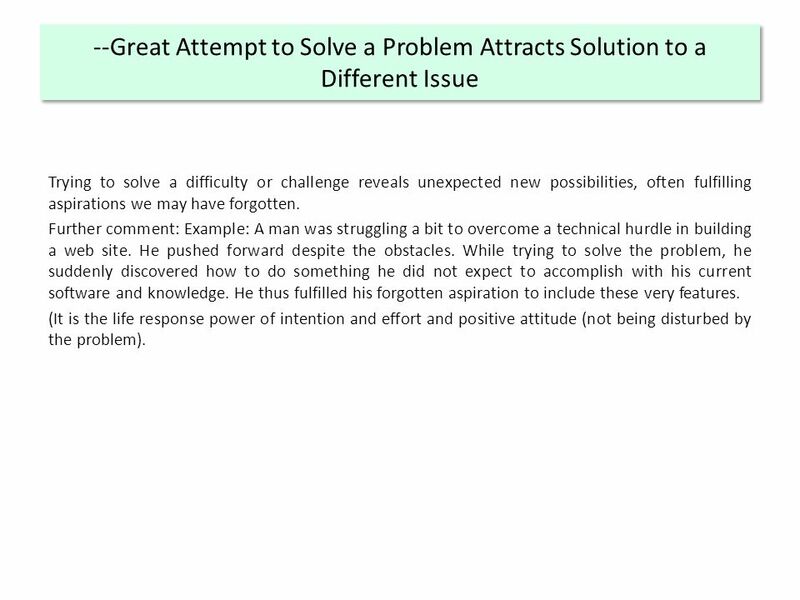 53 --Great Attempt to Solve a Problem Attracts Solution to a Different Issue Trying to solve a difficulty or challenge reveals unexpected new possibilities, often fulfilling aspirations we may have forgotten. Further comment: Example: A man was struggling a bit to overcome a technical hurdle in building a web site. He pushed forward despite the obstacles. While trying to solve the problem, he suddenly discovered how to do something he did not expect to accomplish with his current software and knowledge. He thus fulfilled his forgotten aspiration to include these very features. 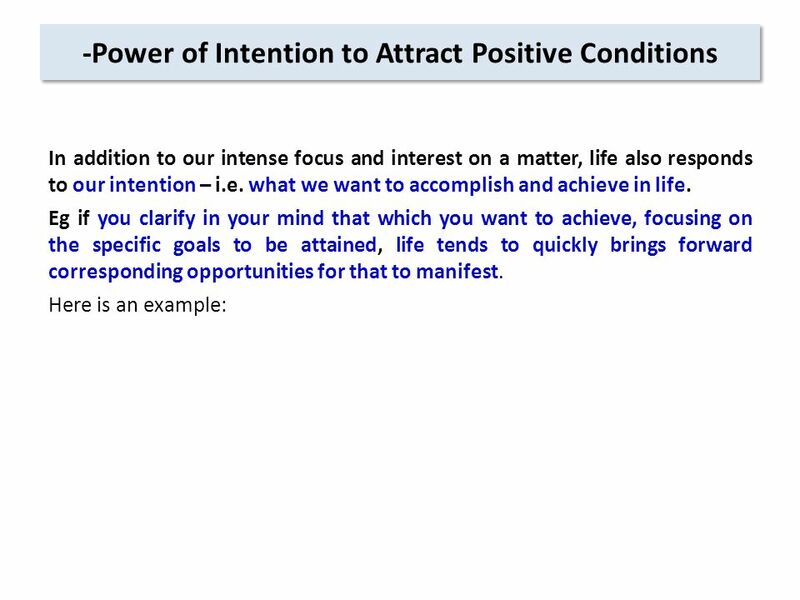 (It is the life response power of intention and effort and positive attitude (not being disturbed by the problem). 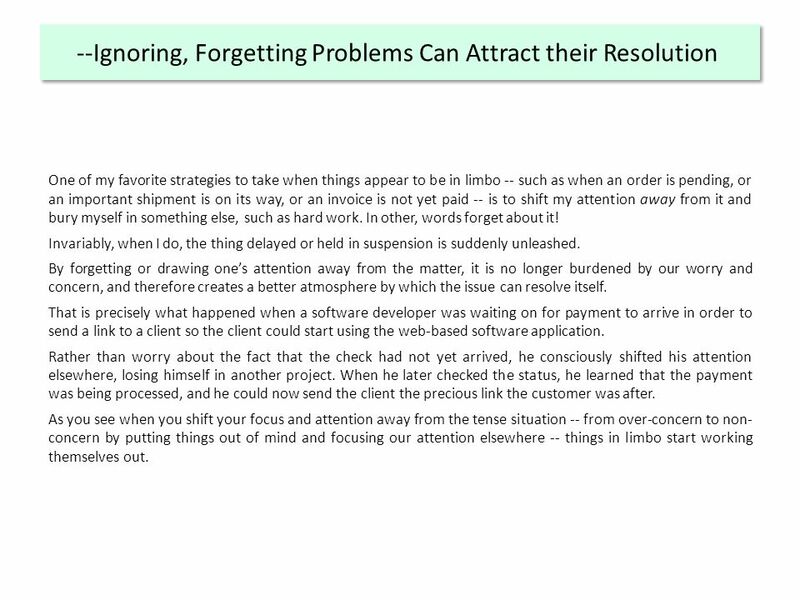 54 --Ignoring, Forgetting Problems Can Attract their Resolution One of my favorite strategies to take when things appear to be in limbo -- such as when an order is pending, or an important shipment is on its way, or an invoice is not yet paid -- is to shift my attention away from it and bury myself in something else, such as hard work. In other, words forget about it! Invariably, when I do, the thing delayed or held in suspension is suddenly unleashed. By forgetting or drawing one’s attention away from the matter, it is no longer burdened by our worry and concern, and therefore creates a better atmosphere by which the issue can resolve itself. That is precisely what happened when a software developer was waiting on for payment to arrive in order to send a link to a client so the client could start using the web-based software application. Rather than worry about the fact that the check had not yet arrived, he consciously shifted his attention elsewhere, losing himself in another project. When he later checked the status, he learned that the payment was being processed, and he could now send the client the precious link the customer was after. As you see when you shift your focus and attention away from the tense situation -- from over-concern to non- concern by putting things out of mind and focusing our attention elsewhere -- things in limbo start working themselves out. 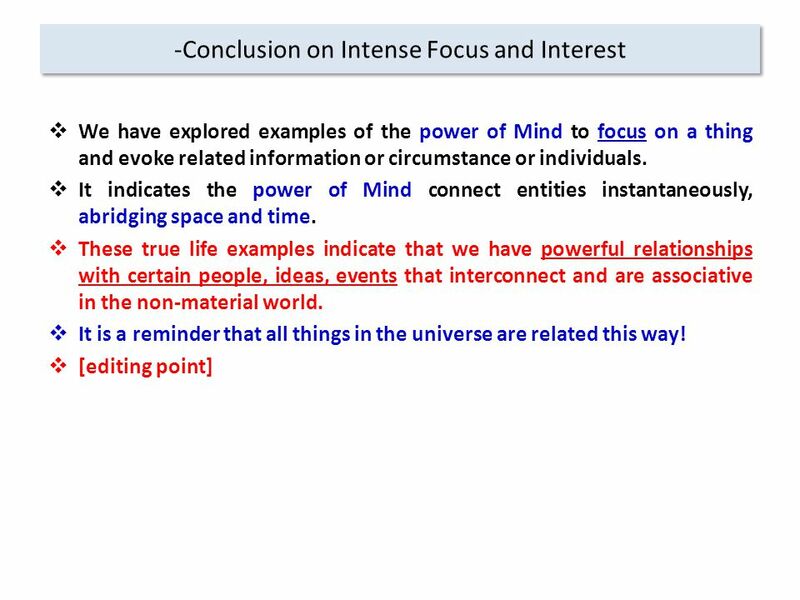 55 Power of (Mental) Curiosity to Attract Explain Example: Curiosity in Problematic Situation Attracts Whereas mind, influenced by the lower vital nature, is generally closed to new possibilities, Curiosity and the knowledge that follows opens the door to infinite-like results. Further comment: E.g. during a heat wave once notices that the fan is not operating as required. 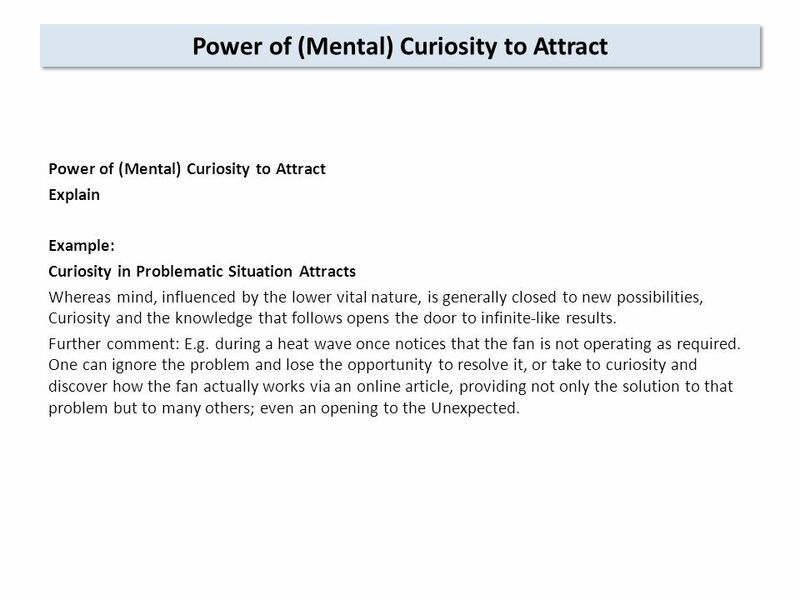 One can ignore the problem and lose the opportunity to resolve it, or take to curiosity and discover how the fan actually works via an online article, providing not only the solution to that problem but to many others; even an opening to the Unexpected. 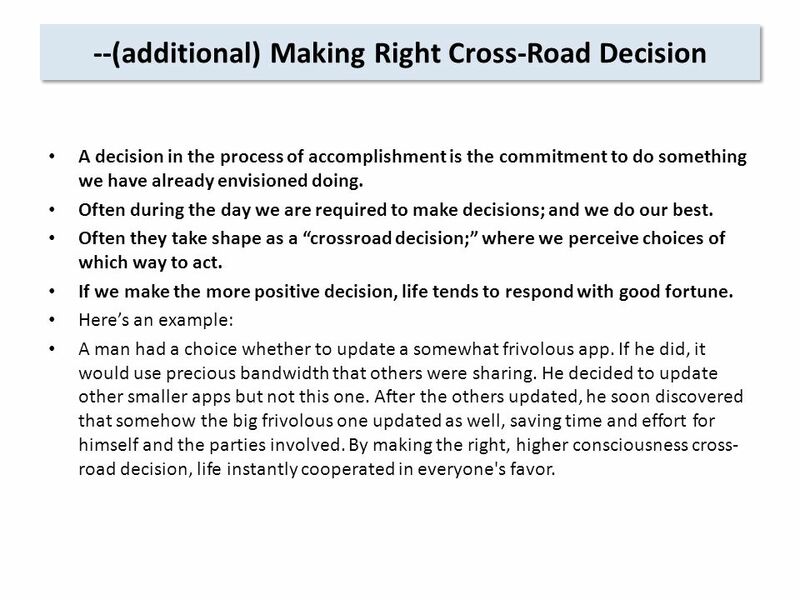 56 --(additional) Making Right Cross-Road Decision A decision in the process of accomplishment is the commitment to do something we have already envisioned doing. Often during the day we are required to make decisions; and we do our best. Often they take shape as a “crossroad decision;” where we perceive choices of which way to act. If we make the more positive decision, life tends to respond with good fortune. Here’s an example: A man had a choice whether to update a somewhat frivolous app. If he did, it would use precious bandwidth that others were sharing. He decided to update other smaller apps but not this one. After the others updated, he soon discovered that somehow the big frivolous one updated as well, saving time and effort for himself and the parties involved. By making the right, higher consciousness cross- road decision, life instantly cooperated in everyone's favor. 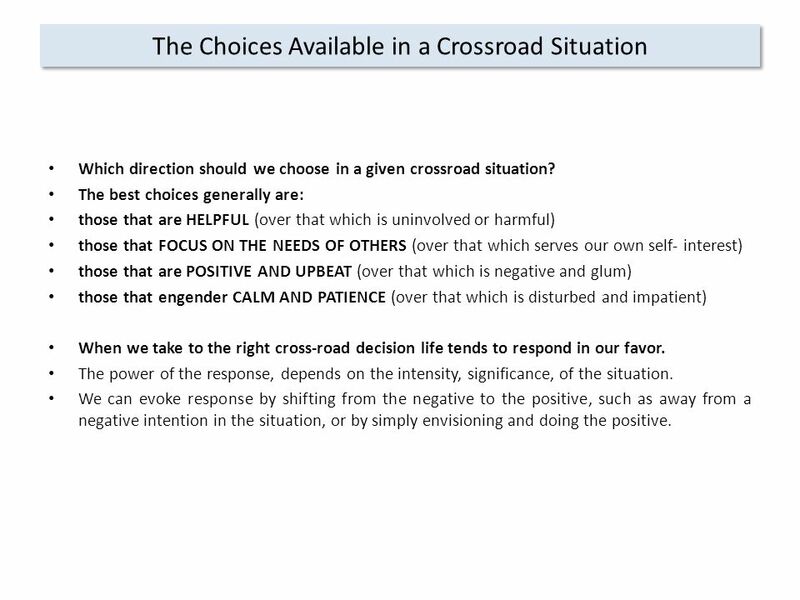 57 The Choices Available in a Crossroad Situation Which direction should we choose in a given crossroad situation? The best choices generally are: those that are HELPFUL (over that which is uninvolved or harmful) those that FOCUS ON THE NEEDS OF OTHERS (over that which serves our own self- interest) those that are POSITIVE AND UPBEAT (over that which is negative and glum) those that engender CALM AND PATIENCE (over that which is disturbed and impatient) When we take to the right cross-road decision life tends to respond in our favor. The power of the response, depends on the intensity, significance, of the situation. We can evoke response by shifting from the negative to the positive, such as away from a negative intention in the situation, or by simply envisioning and doing the positive. 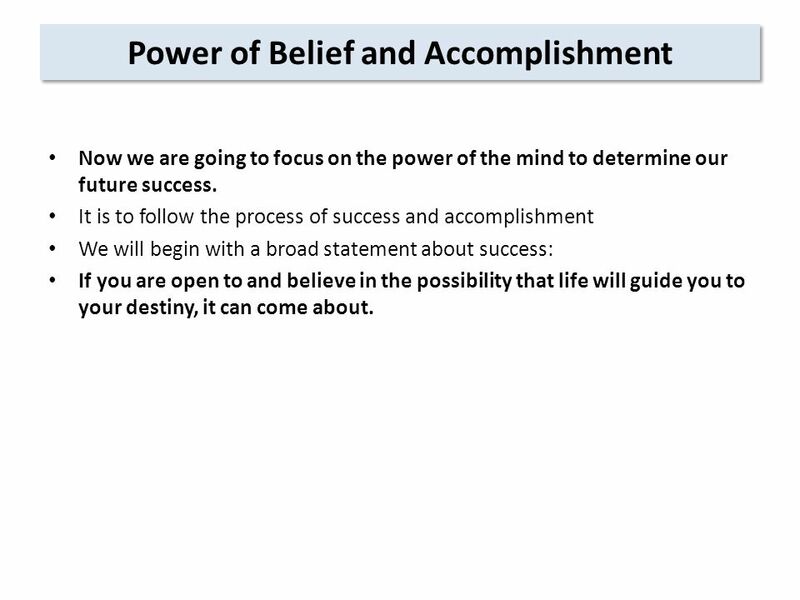 58 Power of Belief and Accomplishment Now we are going to focus on the power of the mind to determine our future success. It is to follow the process of success and accomplishment We will begin with a broad statement about success: If you are open to and believe in the possibility that life will guide you to your destiny, it can come about. 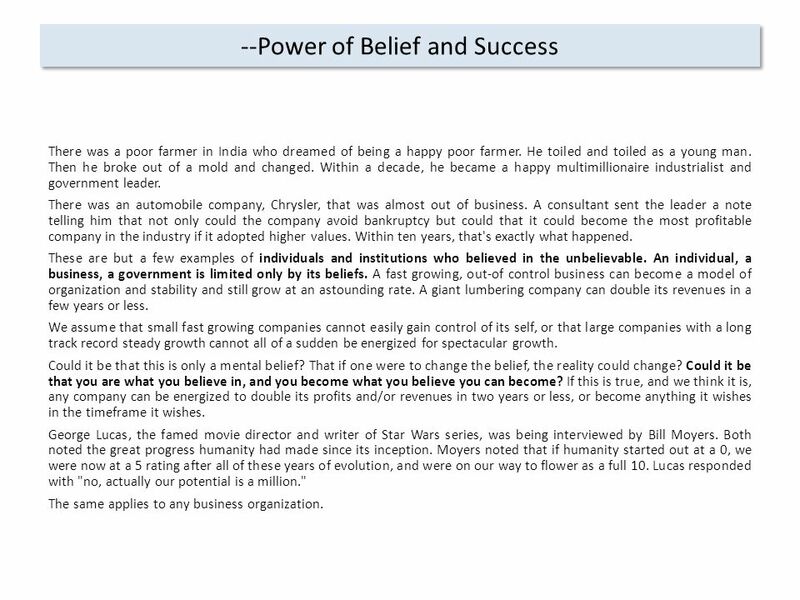 59 --Power of Belief and Success There was a poor farmer in India who dreamed of being a happy poor farmer. He toiled and toiled as a young man. Then he broke out of a mold and changed. Within a decade, he became a happy multimillionaire industrialist and government leader. There was an automobile company, Chrysler, that was almost out of business. 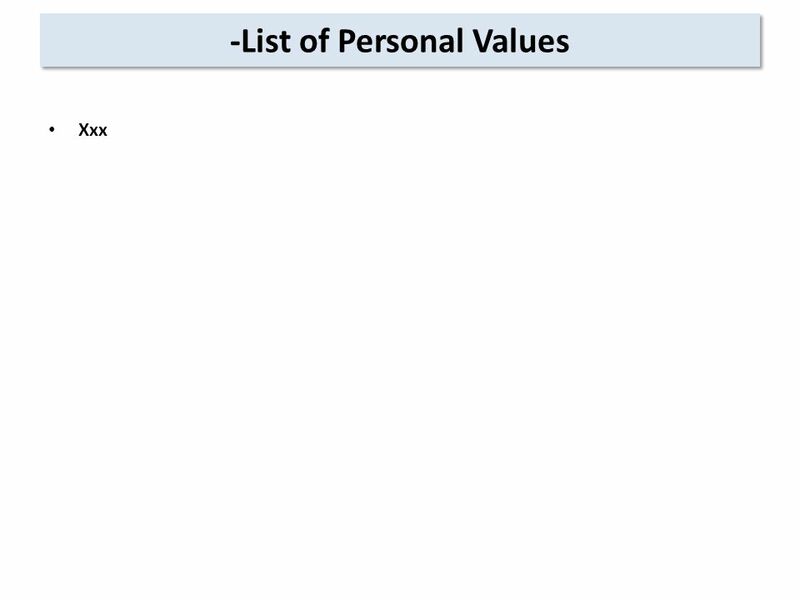 A consultant sent the leader a note telling him that not only could the company avoid bankruptcy but could that it could become the most profitable company in the industry if it adopted higher values. Within ten years, that's exactly what happened. These are but a few examples of individuals and institutions who believed in the unbelievable. An individual, a business, a government is limited only by its beliefs. A fast growing, out-of control business can become a model of organization and stability and still grow at an astounding rate. A giant lumbering company can double its revenues in a few years or less. We assume that small fast growing companies cannot easily gain control of its self, or that large companies with a long track record steady growth cannot all of a sudden be energized for spectacular growth. Could it be that this is only a mental belief? That if one were to change the belief, the reality could change? Could it be that you are what you believe in, and you become what you believe you can become? If this is true, and we think it is, any company can be energized to double its profits and/or revenues in two years or less, or become anything it wishes in the timeframe it wishes. George Lucas, the famed movie director and writer of Star Wars series, was being interviewed by Bill Moyers. Both noted the great progress humanity had made since its inception. Moyers noted that if humanity started out at a 0, we were now at a 5 rating after all of these years of evolution, and were on our way to flower as a full 10. Lucas responded with "no, actually our potential is a million." The same applies to any business organization. 60 --Power of Belief to Become Anything One Wants Comes True In 1968, Greg left his house with a trunk containing all his belongings and $47. For the first time in his life, he was poor. Instead of taking stock of what he didn't have, he focused on one overriding thought. "From this day forward, I can be anything I want to be.“ This was his self-conception and attitude. Three and a half weeks later, he got a low-level job quarterbacking an ice cream parlor. A friend's father was president of the nearby bank. It didn't take long for Greg to go over to the bank, sell himself to the father, get into the banking business, and later into his own multimillion-dollar sales organization. 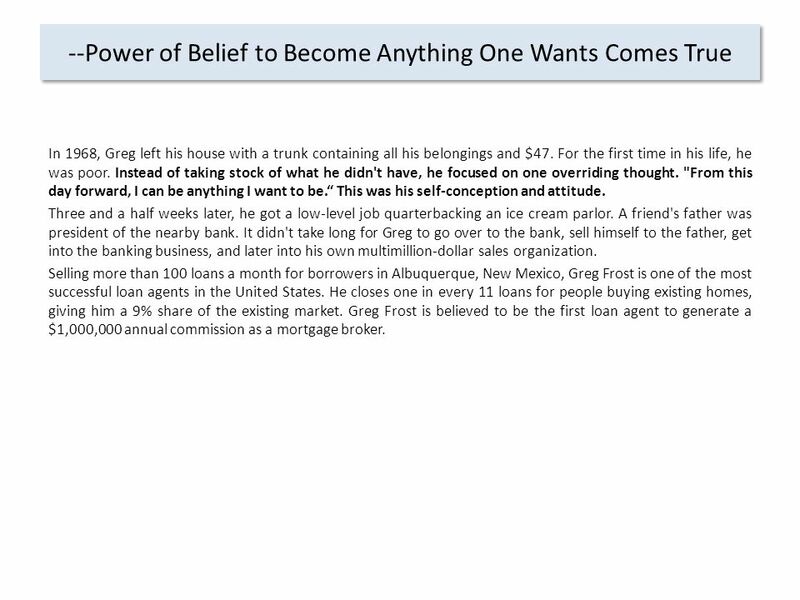 Selling more than 100 loans a month for borrowers in Albuquerque, New Mexico, Greg Frost is one of the most successful loan agents in the United States. He closes one in every 11 loans for people buying existing homes, giving him a 9% share of the existing market. Greg Frost is believed to be the first loan agent to generate a $1,000,000 annual commission as a mortgage broker. 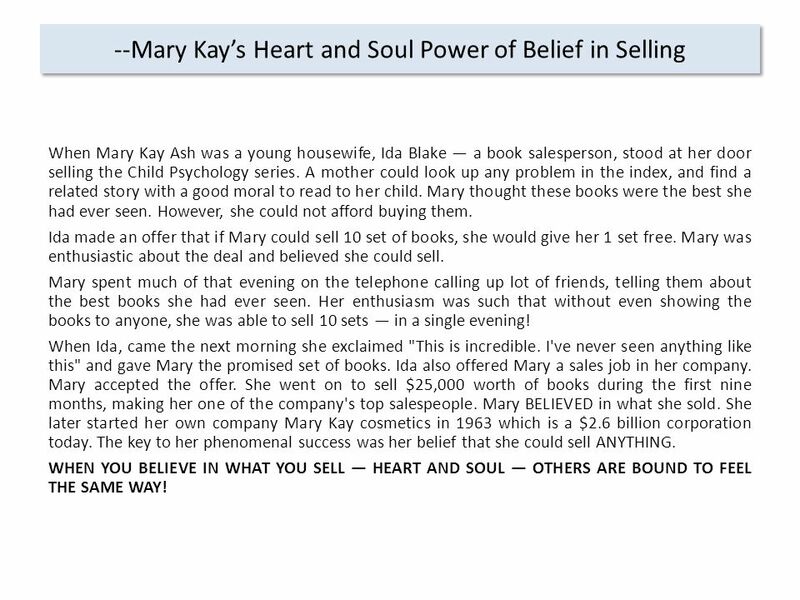 61 --Mary Kay’s Heart and Soul Power of Belief in Selling When Mary Kay Ash was a young housewife, Ida Blake — a book salesperson, stood at her door selling the Child Psychology series. A mother could look up any problem in the index, and find a related story with a good moral to read to her child. Mary thought these books were the best she had ever seen. However, she could not afford buying them. Ida made an offer that if Mary could sell 10 set of books, she would give her 1 set free. Mary was enthusiastic about the deal and believed she could sell. Mary spent much of that evening on the telephone calling up lot of friends, telling them about the best books she had ever seen. Her enthusiasm was such that without even showing the books to anyone, she was able to sell 10 sets — in a single evening! When Ida, came the next morning she exclaimed "This is incredible. I've never seen anything like this" and gave Mary the promised set of books. Ida also offered Mary a sales job in her company. Mary accepted the offer. She went on to sell $25,000 worth of books during the first nine months, making her one of the company's top salespeople. Mary BELIEVED in what she sold. She later started her own company Mary Kay cosmetics in 1963 which is a $2.6 billion corporation today. The key to her phenomenal success was her belief that she could sell ANYTHING. WHEN YOU BELIEVE IN WHAT YOU SELL — HEART AND SOUL — OTHERS ARE BOUND TO FEEL THE SAME WAY! 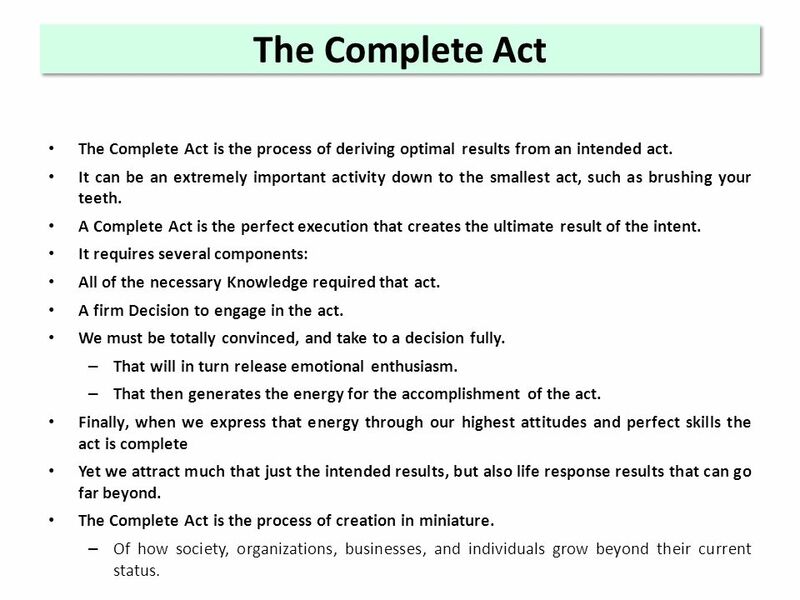 62 The Complete Act The Complete Act is the process of deriving optimal results from an intended act. It can be an extremely important activity down to the smallest act, such as brushing your teeth. 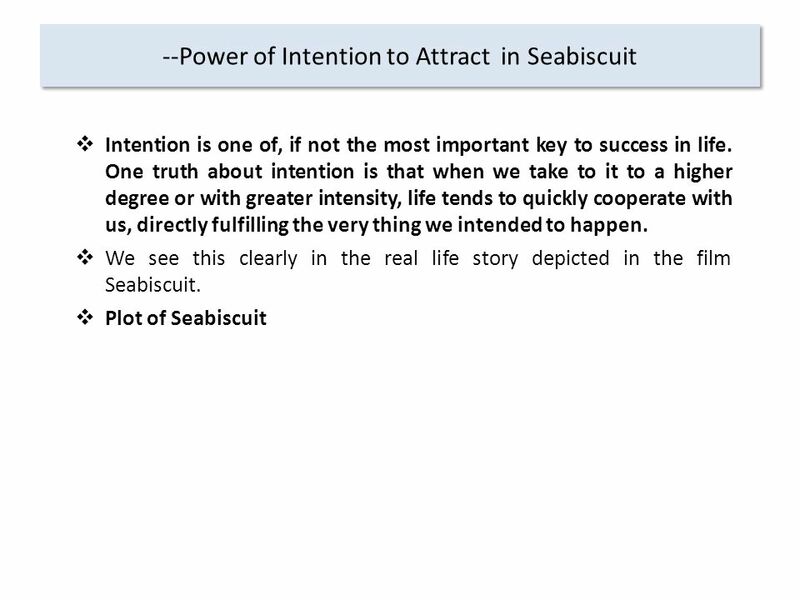 A Complete Act is the perfect execution that creates the ultimate result of the intent. It requires several components: All of the necessary Knowledge required that act. A firm Decision to engage in the act. We must be totally convinced, and take to a decision fully. – That will in turn release emotional enthusiasm. – That then generates the energy for the accomplishment of the act. 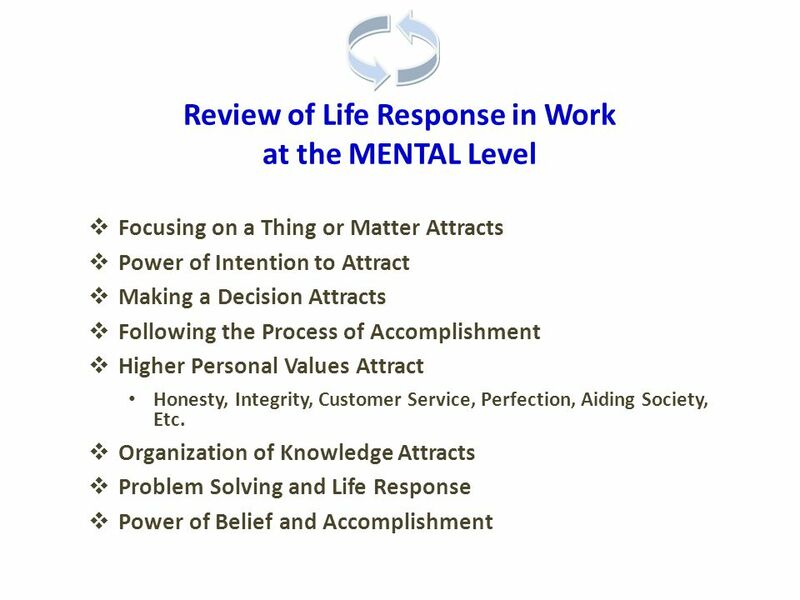 Finally, when we express that energy through our highest attitudes and perfect skills the act is complete Yet we attract much that just the intended results, but also life response results that can go far beyond. The Complete Act is the process of creation in miniature. 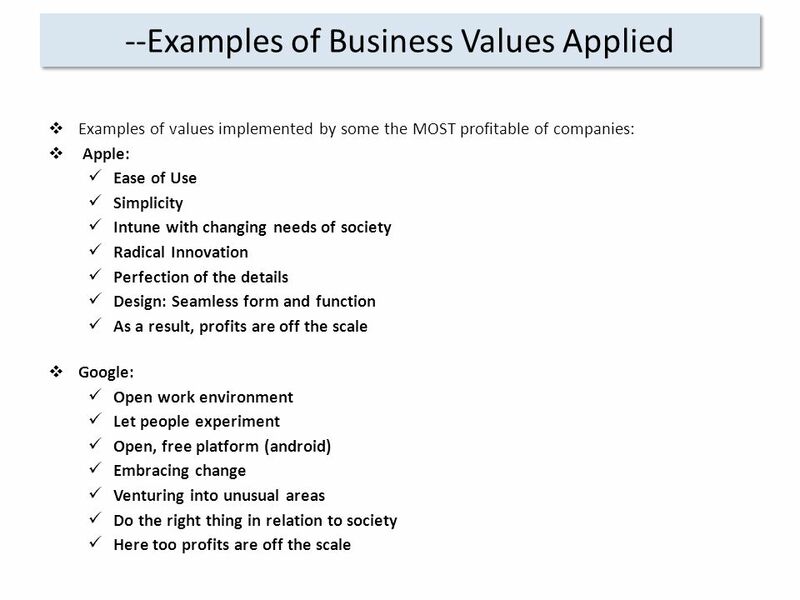 – Of how society, organizations, businesses, and individuals grow beyond their current status. 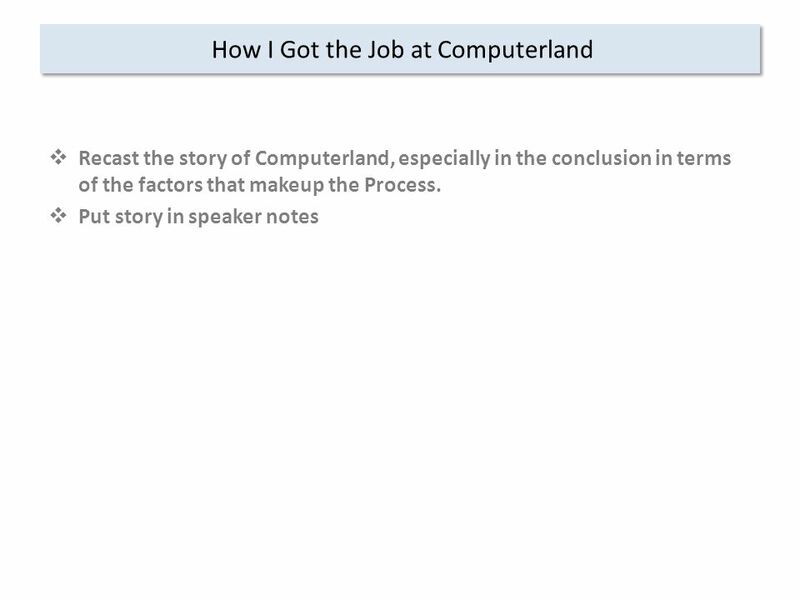 63 --The Complete Act: An Scenario I have been assigned to work on several tasks on a project One of the tasks is to move the computer room to a new location. 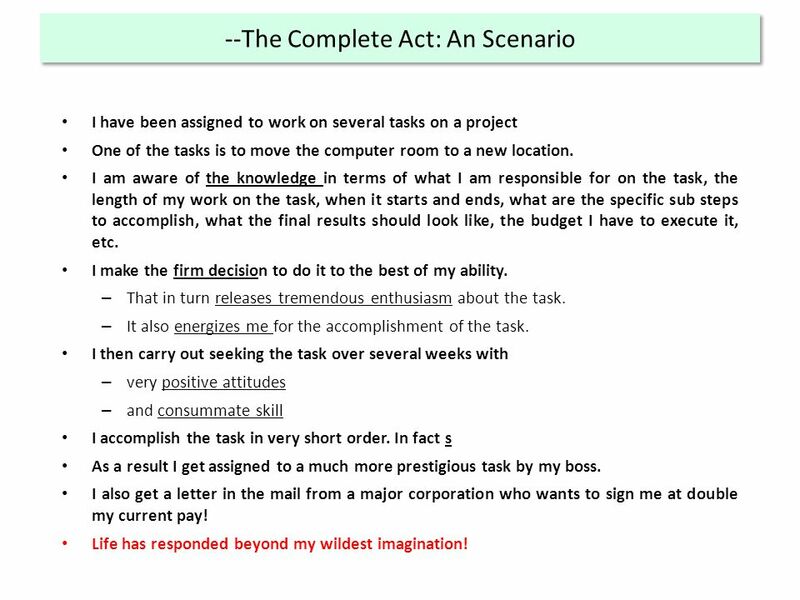 I am aware of the knowledge in terms of what I am responsible for on the task, the length of my work on the task, when it starts and ends, what are the specific sub steps to accomplish, what the final results should look like, the budget I have to execute it, etc. I make the firm decision to do it to the best of my ability. – That in turn releases tremendous enthusiasm about the task. – It also energizes me for the accomplishment of the task. I then carry out seeking the task over several weeks with – very positive attitudes – and consummate skill I accomplish the task in very short order. In fact s As a result I get assigned to a much more prestigious task by my boss. I also get a letter in the mail from a major corporation who wants to sign me at double my current pay! Life has responded beyond my wildest imagination! 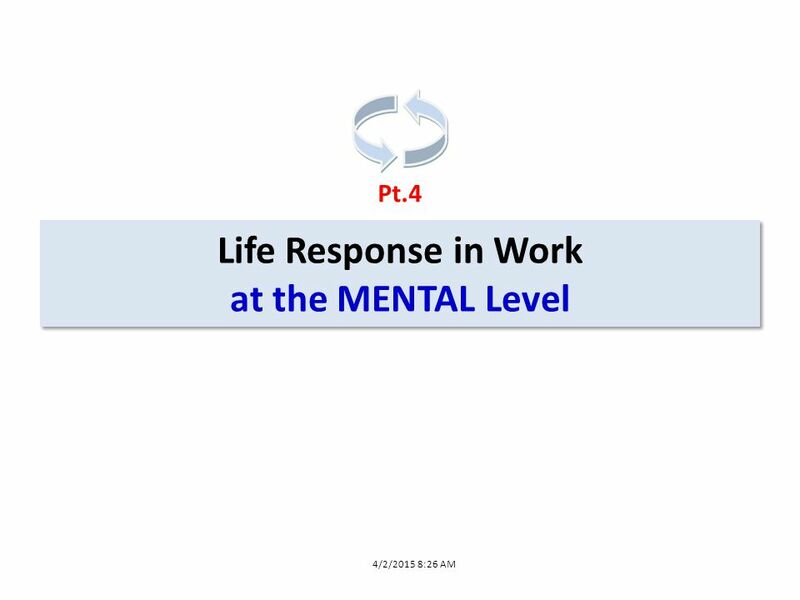 Download ppt "Life Response in Work at the MENTAL Level Pt.4 4/2/2015 8:26 AM." Why Should You Use Goal Setting? Trustworthy: to have belief or confidence in the honesty, goodness, skill or safety of a person, organization or thing. 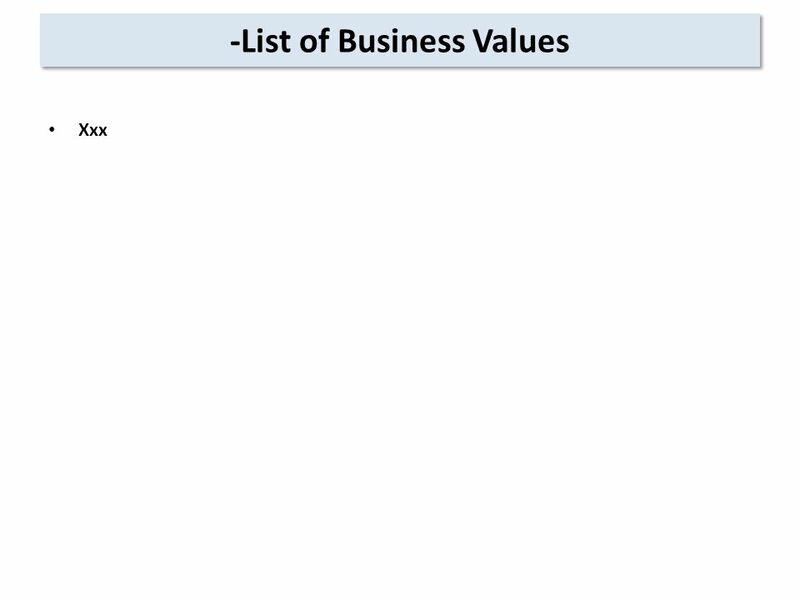 © Cengage Learning – Purchasing & Supply Chain Management 4 ed ( ) Practice 16. Negotiating techniques and rules of conduct. WORKABILITY III PRESENTS EFFECTIVE BUDGETING SKILLS FOR COLLEGE & BEYOND ONLINE WORKSHOP SERIES. How students check the progress of their applications Applicants can follow their progress by using Track. When each university or college makes a decision. The Philosophy of Exotischism Ignorance Is No Excuse 442 Most of us feel that we have a pretty good idea as to what is right and what is wrong, and we. 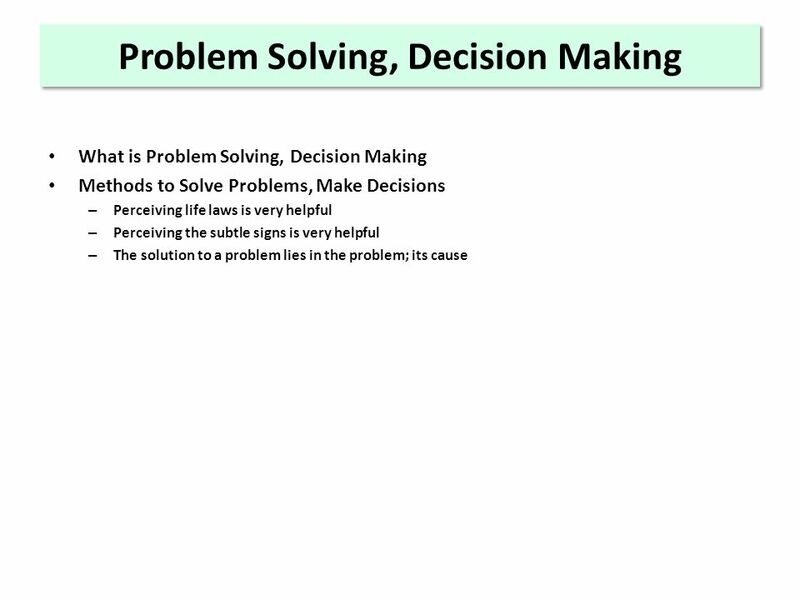 Using Problem Solving in NAMI signature programs An instructional module for people who have already been trained to facilitate a NAMI support group or. 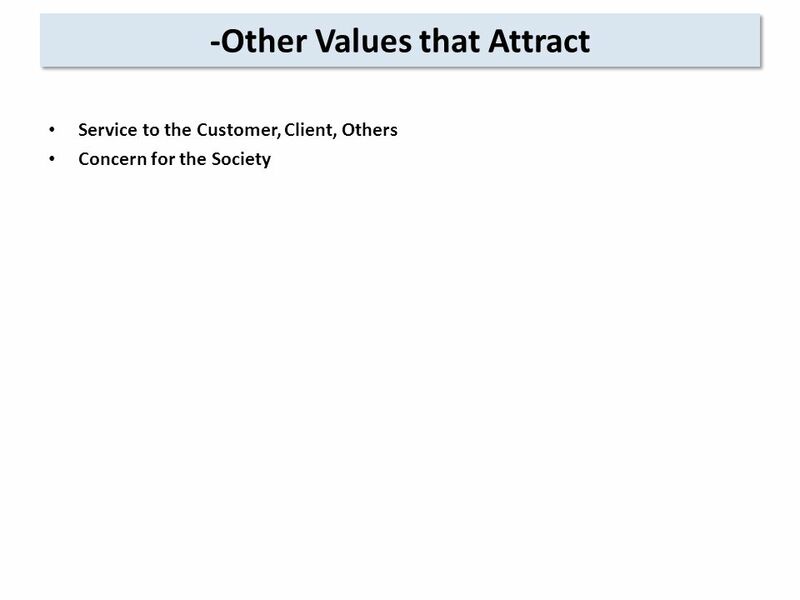 Small Business Resource Power Point Series Factors in Buying a Going Concern. Building Wealth over the Long-Term Objective: Explain why an early start in saving and investing increases a household’s capacity to build wealth. Explain.